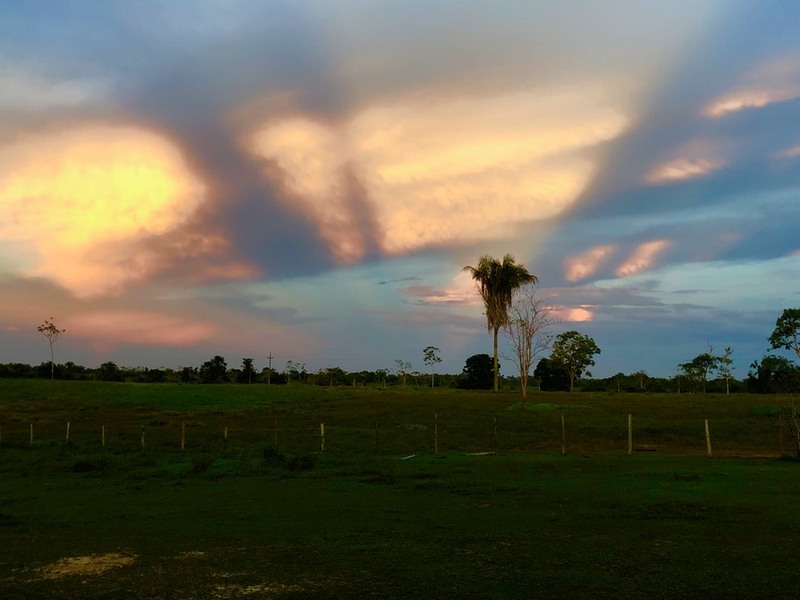 Come and see what God is doing in the jungles of the Amazon basin! We feel humbled and honored that He has chosen and enabled us to serve Him in this beautiful place. It’s a challenging thing, trying to do our job during rainy season in the jungle. Every break in the rain is a mad scramble to get something done. So much is dependent on the weather, and the weather has been insane! 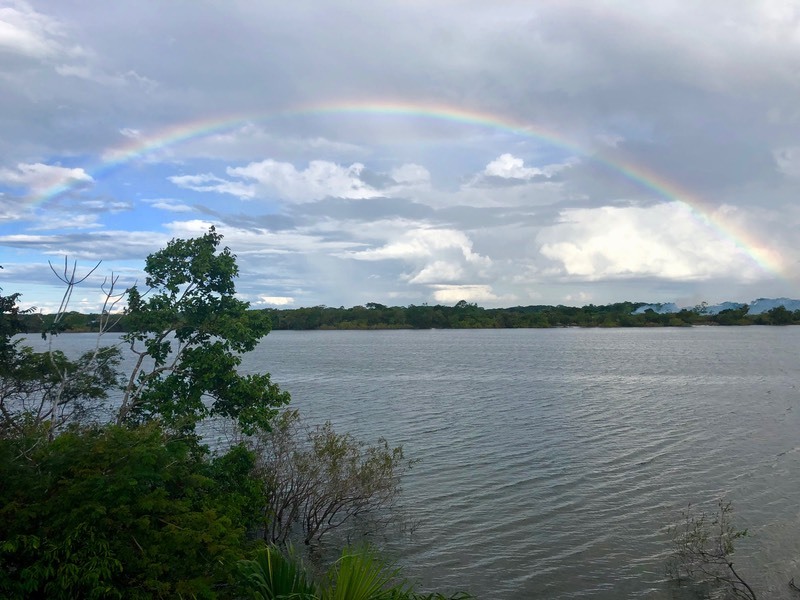 This is the wettest, rainiest, rainy season that we’ve had in years, but thankfully, the flooding has not been nearly as bad as in past years. 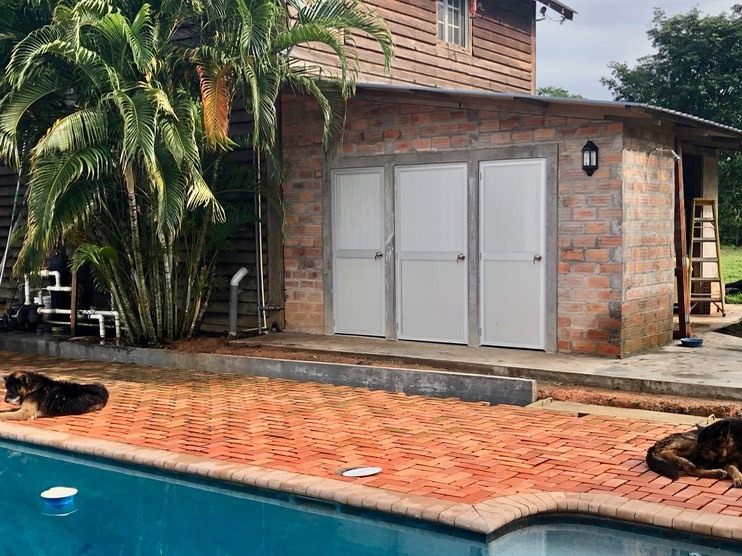 Between the daily storms and rain showers, Vann has built and outfitted the poolside bathrooms with a storage closet in the middle. The bathrooms are a huge blessing to have for people coming to the pool to feel more comfortable, and to keep all of the wet bodies outside! We’ve been super blessed to have Mike Huls back here for a visit! He is always such a willing and able help around here, and brings a fresh vision and energy to this work that we are so very grateful for. 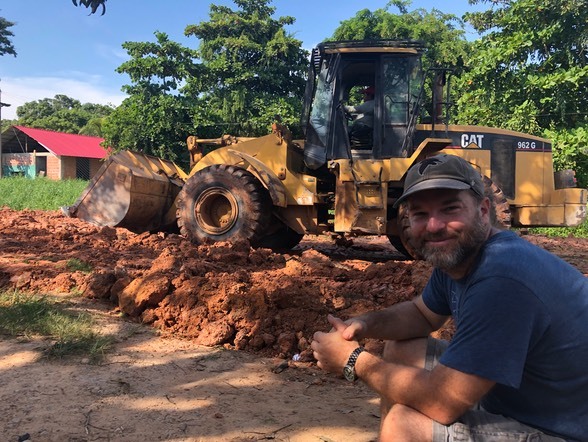 We are thrilled to get to watch the great big things that God is doing in his life, and look forward to his future partnership on this mission base! 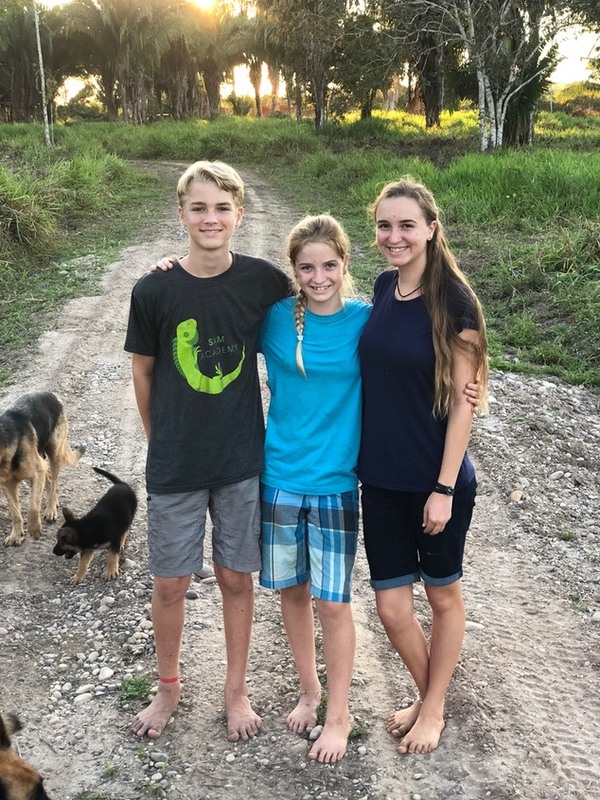 Please pray for the Dumitru family as they are out in the tribe this month. They also have a young couple with them visiting their beloved tribe for the first time! We helped them get out and on their way, and also helped with supply buying and shipping some urgent, missing machine parts out to them within their first week out. 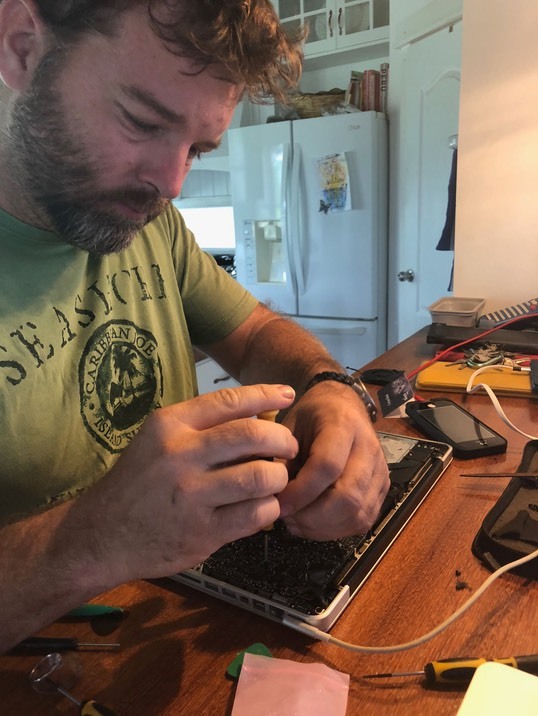 Tribal missionary support can look different on any given day – one day it’s researching new solar power tech, or even flying out to the tribe for hands-on projects, and sometimes it’s breaking down, rebuilding and truing-in a pellet gun for hunting small game. Every day brings it’s own puzzles to be solved, and people to serve. The latest youth group here was a super special one with another baptism in our pool! 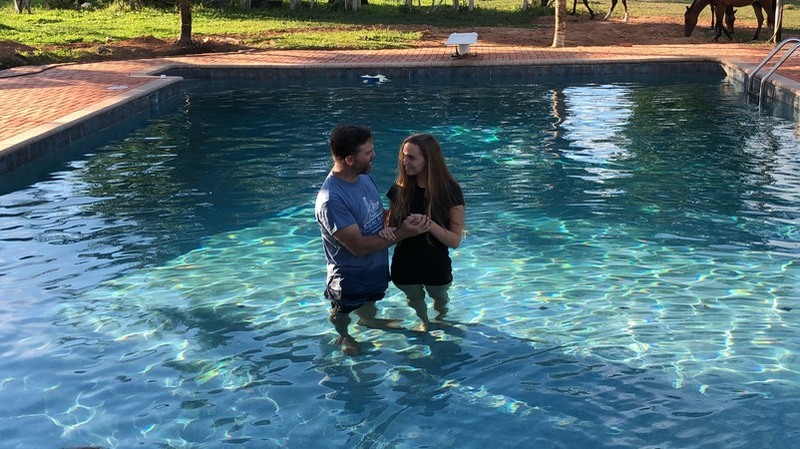 A precious young lady from our mission academy made the life changing decision to follow Jesus, and wanted to make a public profession of her faith by being baptized by her father. We were so privileged to be able to witness and host such a beautiful time in her life! Vann had a birthday at the beginning of this month! This man. He works hard, and plays hard and does everything to the very best of his abilities – which are amazing. What a blessing to get to celebrate him! 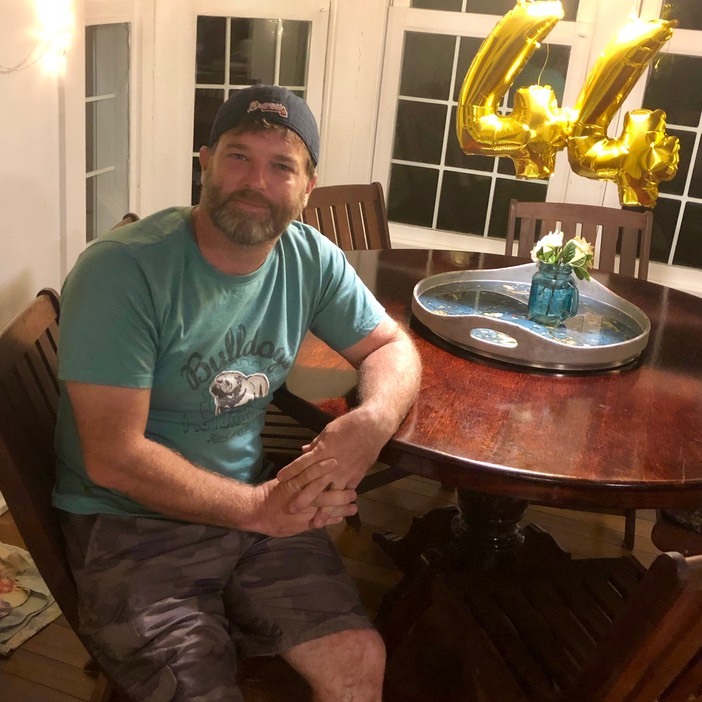 The next weekend we were privileged to host the fortieth birthday party of one of our dearest friends. 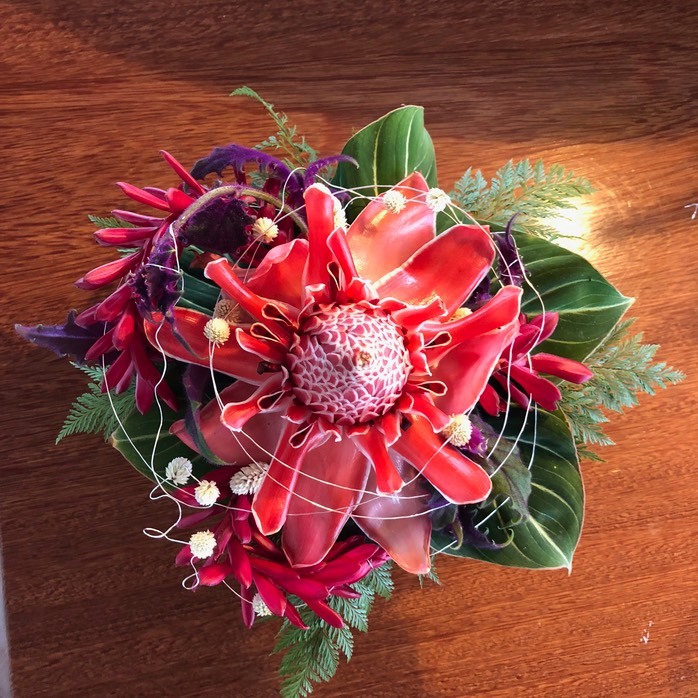 It was the nicest dinner party I’ve ever put on, and so very worth all of the effort to get to shower her with some extra love after she’s just come through one of the hardest years of her life. She is a beautiful example of a Godly woman! This whole month has been one long string of sickness in our house, passing a flu virus that lasts a week or more from person to person. So far Vann and Clara have not gotten it, and I hope that it ends here with me. Please forgive any disjointedness in this update, as I am currently on day four of my turn with the fevers. It could be so much worse with all of the dengue going around. The Lord is merciful, and gracious, and we are very grateful that this is just the flu. Please pray for Milka, our house helper. She has had major surgery this week, and it is our prayer that the Lord will give her healing and renewed strength after going through this trial. Please pray also for Estefita, my friend with the brain tumor, whose 10-year-old son has leukemia. 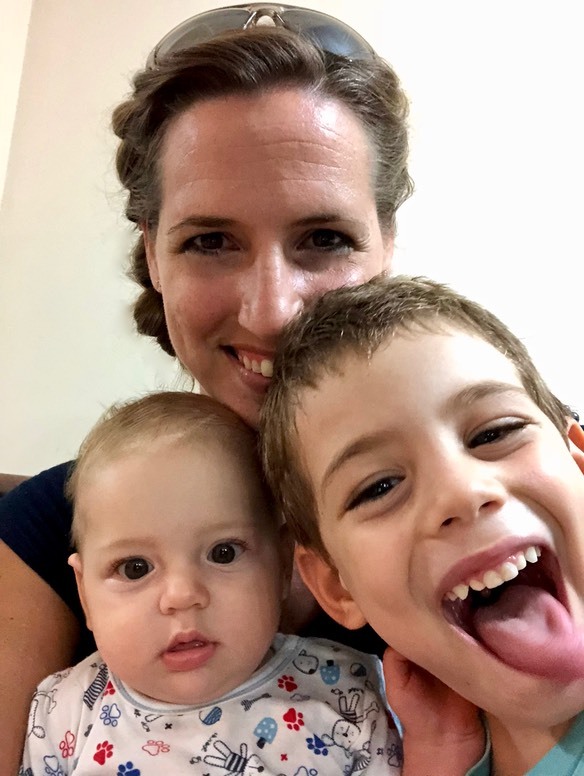 She has been sent to Lima for emergency surgery, and her son has begun to run fevers again. He is unable to receive chemotherapy or treatment of any kind due to sever allergic reaction to all medication. He is still alive due to blood transfusions and God’s mercy. Please pray for their spiritual salvation, for their physical health, and financial need. Thank you to each of you who pray, give, call or write to help keep us going, enabling and encouraging us in the work. We just simply could not do this without you. May the Lord bless you and keep you until we meet again! Something that a dear friend of mine was sharing with me that I’ve been mulling over for a while, and I’d like for you to think about too is this; with what exactly do you measure your success in life? Typically, we think of success as something that we can tangibly measure or count, like a completed “to do” list, and accomplishments, education, and a career, marriage, and children, visible ministry etc. But what matters most to God are the immeasurable things - things that cannot be counted so easily. He told us that the two things that matter the most are: loving Him, and loving others. Love is immeasurable, and is the one thing that matters eternally. Are you measuring your success by your own standards, or by what matters to God? Can people see your success, or can they feel God’s love for them through your life? We do actually have a long “to do” list of things that we have already started working on to get things in order around here, preparing for our seemingly long absence this summer. 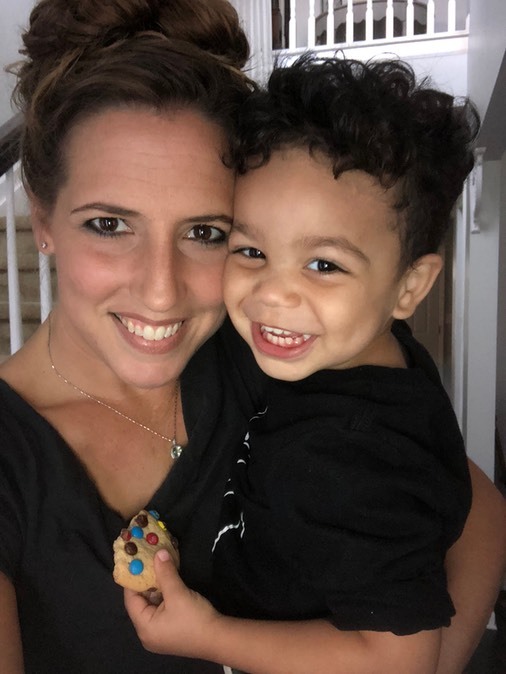 As much attention as this base needs while Vann is here, it is rather stressful to try to think of all of the ways that we need to plan to keep things running well while he’s not here for the families that we serve, and that live here on base. In the midst of the many projects we find ourselves in, there have been many opportunities to serve! Vann flew out to the village where the family that moved into our garage apartment works, to help them install a satellite internet system! The technology these days – it just astounds me. There is no electricity in their village, but they now have internet access to the outside world. Unbelievable! We are so privileged to get to serve these diligent kingdom workers! 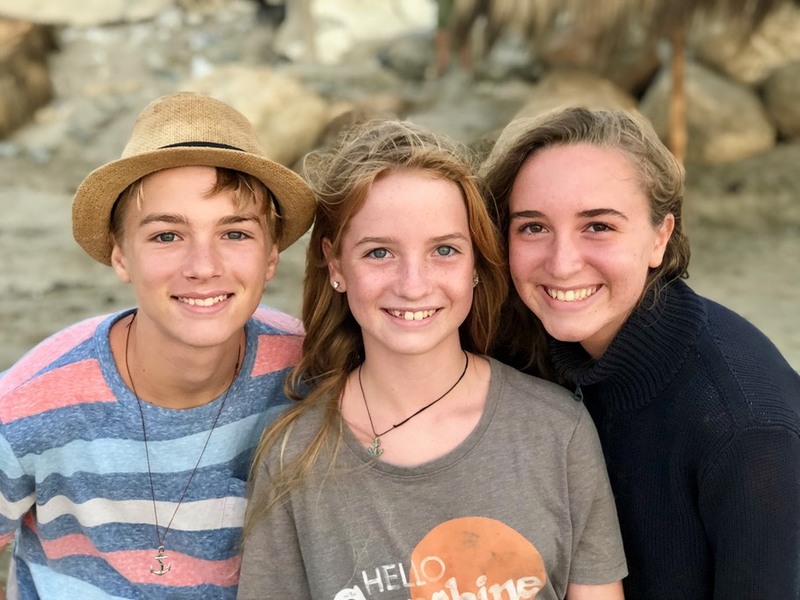 Our children had the opportunity to go to a summer (it is still summer in the southern hemisphere) camp for missionary kids in Lima this month. The program was geared specifically towards mk’s, and their unique issues, and world view. 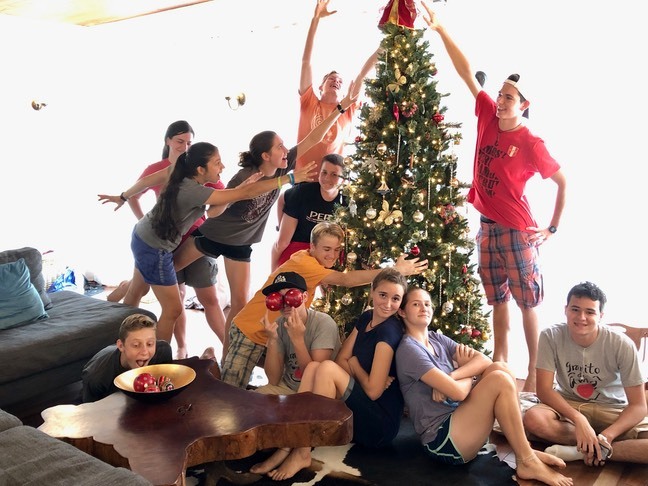 They had a blast, and came home with renewed dedication to their relationship with Jesus, and some new friends that live in other countries and continents! 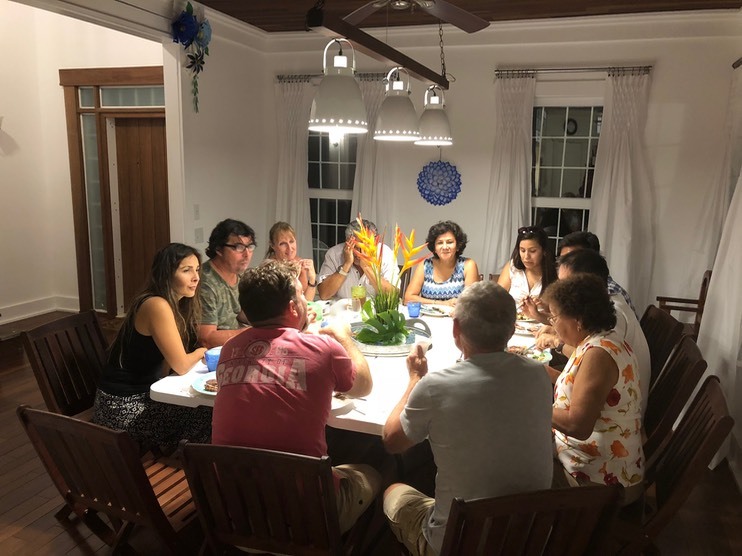 As usual, this mission house has been kept full to the brim, and busy as ever with people coming and going, to stay for a few hours for the pool, or a meal and refreshment, or a few days for some good, quiet rest. There have been large groups for prayer meetings, youth group, dinner club, and family reunions. We are so super blessed to get to love and serve so many! The same friend I mentioned in the beginning, is one whom we have come to love like family. Well, because that’s what she is to us now. 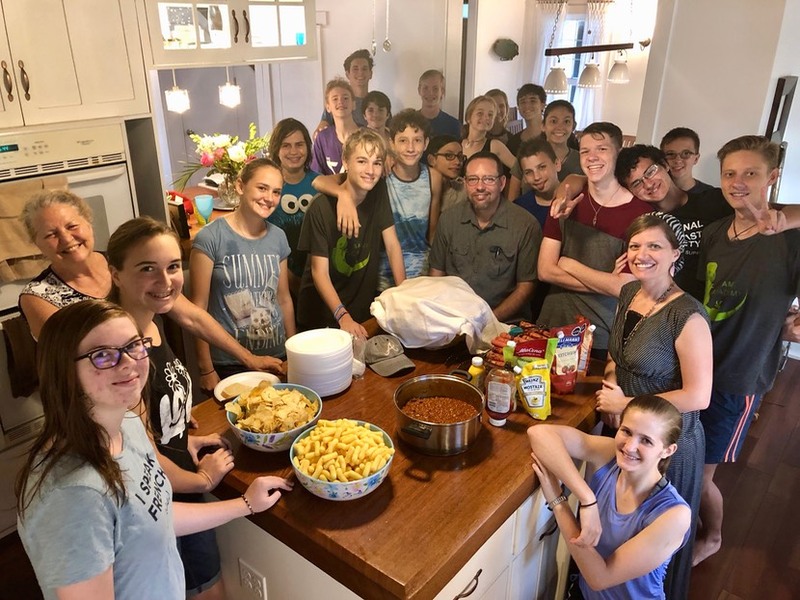 It’s a phenomenon that’s hard to explain to those outside of the missionary community, but it’s a fast, strong connection built on shared experiences and struggles, and the general dependence we have on one another as foreigners in a strange land that need all of the help that we can give each other. So, this precious friend has now gone on to the next adventure that the Lord is calling her to, and that is as it should be, since she was never here to stay forever. We knew from the beginning that we couldn’t keep her with us for very long, but for the time that we had together, we loved her like family. The problem with love though, is that it opens your heart to hurt too. We have had to say goodbye to so many in the very long list of those who have come and gone from this jungle town of ours over all of the years, and it just doesn’t get any easier to let them go. Even though we know that it’s going to hurt, we have to keep on reaching out and loving those around us because it’s what we’re called to do. Is there someone that you need to be reaching out to? Maybe someone that is alone, or who might not love you in return, or whom you even might not like very much? God has said that the way that people will know that we are His children is by the love we show. Success immeasurable. For us, this January has been all about new beginnings and making plans! 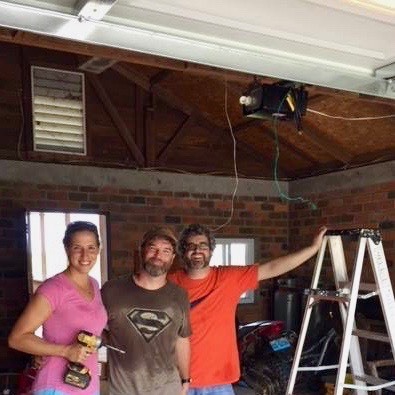 The largest part of our time and energy this last month has been remodeling the garage apartment for a precious missionary family that works out in a remote tribe on the border of Brazil. They will be living here on our base when they come out from the tribe every few months! The apartment had seen a solid, hard ten years of our family of five living in it without much attention to it while we built the main house, so it was in sore need of a fresh coat of paint. As we began the work, we found more, and more projects that needed doing. The upstairs loft was finally finished with hardwood flooring instead of just plywood. The molding was completed around all of the windows for the first time, and the entire end wall that houses the air-conditioner was removed and redone due to the old air-conditioner leaking. The “little house” looks wonderful, and we are so pleased that it will finally be used as a guesthouse in the service of the King! 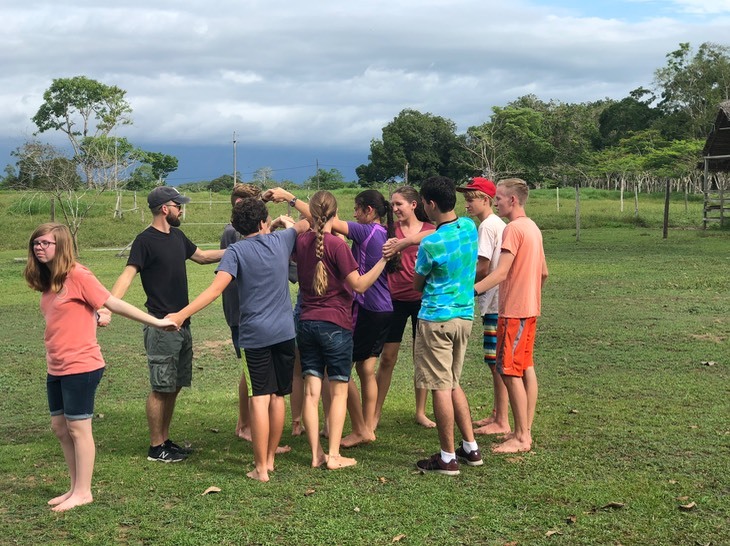 It has been a privilege to serve a young missionary couple that is working out in a Matses tribe; the same couple that Vann went out to help in November. They had an opportunity to have a supply flight make a drop to them a couple of weeks ago, so we spent a couple of days in town shopping and gathering their list of supplies. Also on their list was a “meal from Vanessa, and if possible, chili please?” As they do not have refrigeration, it could only be a meal for the day. What a delight to get to serve this devoted young couple! 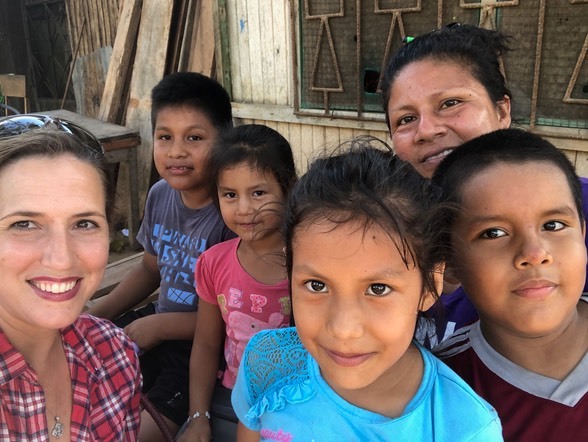 We had set up a schedule for calling them on their tribe’s satellite phone every week to check on them, but halfway through their stay, lightning struck the phone installation along with two people who were near some connected cables. Thank God, everyone lived. Vann spent the next couple of days trying to get ahold of them on their satellite texting device. This was the couple’s first month living out there on their own. To have such a traumatic event happen, and to have no help but from God, was a challenge well met. The trauma from such a scare has understandably had its effect, and we are doing all that we can to help them debrief, and to minister to them on their return. We are also beginning our plans for furlough this coming summer! Our plans have to center around the children’s school schedule as we have two in high school now. This will probably be our last furlough with all five of us together, and we will be spending some of our time college “shopping” for our Corynn. 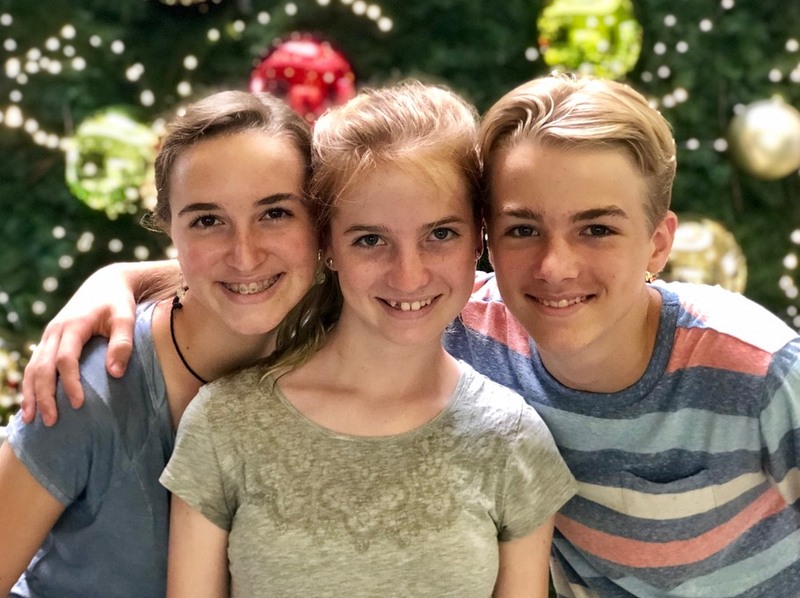 She does not yet have a plan for what exactly to study, and she is praying for the Lord’s direction in her life, but there is still some time as she is just finishing her sophomore year. Please pray with us, that God will provide for her in every way. July 5th – August 13th – Maryland, Georgia, South Carolina, Tennessee, and Florida to spend time with family and friends, and give an update to our supporting churches. It will be our pleasure, and honor to be able to see as many of you dear ones as possible this summer! Ten weeks is just not very much time. It will once again be a whirlwind trip, but we trust that the Lord will direct our steps! 2018 has just flown by! I don’t know about you, but every passing year seems to pass quicker than the one before. This month has been so full of lovely happenings with people that we’ve loved a long time, and some that are brand new to our lives! The most exciting of events this month for us personally was our Corynn’s baptism! 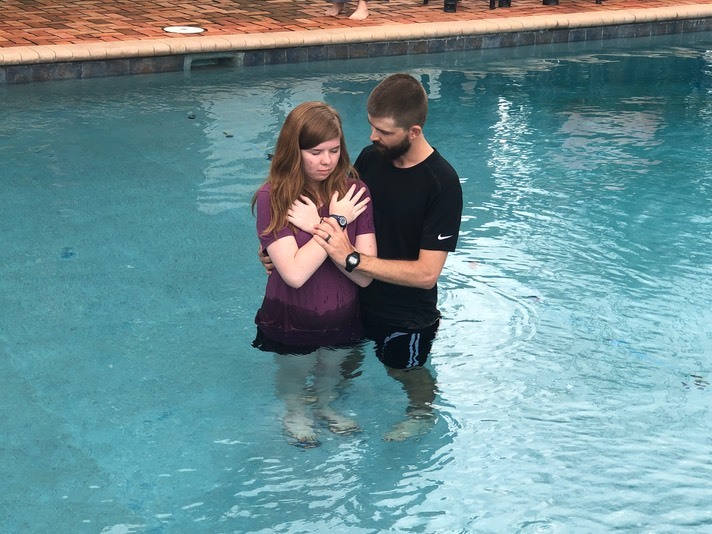 She has been expressing a desire to be baptized, and asked to be baptized by her Daddy in our pool with her youth group as witnesses, so that’s exactly what we did! This happens to have come in the same month of her Sweet Sixteenth Birthday! We are so very proud of the lovely, kind young woman that she is, and can’t wait to see what the Lord has in store for her future! It had come to our attention that the lady that now helps me keep our house clean and presentable for all of the events and hosting that we do, lives herself with her family of four growing boys in a shack that floods every time there is a torrential rain. Which is half of the year. And when it rains, it not only floods her house with rainwater, but it brings with it the sewage water of half of the neighborhood. They have put all of their beds on blocks, and when it’s especially high, they have to wade through half a foot of water to walk through their house. It’s really bad. Her family is sick so much of the time, but through so many years of living this way, she has done her best to trust God for patience. As she and her husband continue to struggle to make ends meet, we felt that the Lord would have us help them in a big way this Christmas. We bought fourteen truckloads of fill dirt, and coordinated for a tractor to spread and pack it down to lift their home up out of the mire and muck. It will take a rainy season to help the dirt settle and pack down further, so they’re not immediately out of the sewage floods, but this is a huge step forward! She feels hope for the future for the first time in a long time, and that is a gift in and of itself! There have been so many events and visitors here this month that it continues to be evident that the Lord is truly putting this house to use for the service of the saints, and for the kingdom. 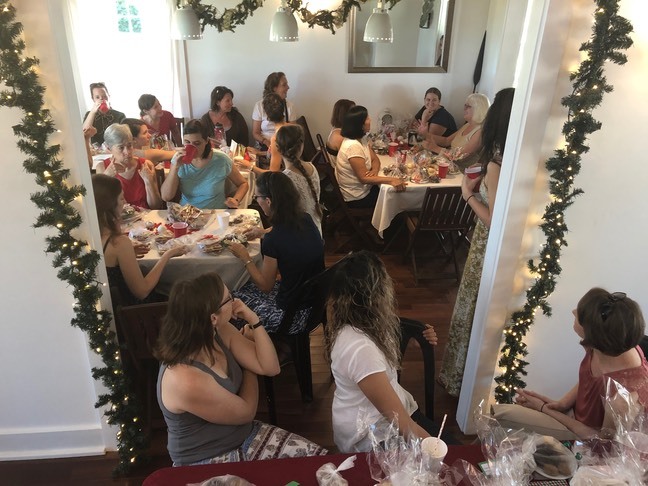 From Christmas parties for the missionary community to our neighbor’s 40th birthday party, youth groups and wedding preparations with hair and makeup and with the house as “The location” for engagement photo shoots, there hasn’t hardly been a quiet moment. It has been an epic month for serving, and hosting! It took five days to get here trying to catch a standby flight, but my mother has finally made it here! We are super blessed to have her here with us! It is hard to put into words the blessing that family is to us. We knowingly signed up to live a life so far removed from them, so when we do get to be together, it is a treasure. She is a treasure. We were also super blessed this Christmas season as a young missionary lady came to join our week of holiday celebrations! 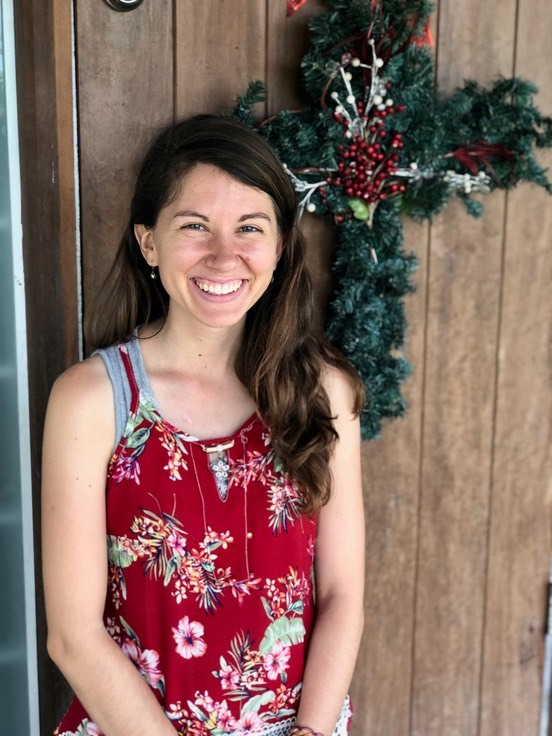 She brought so much warmth and kindness with her gentle and caring spirit, that not only were we super blessed by her and her help with hosting, we are also so excited to watch and see all of the great things that God has in store for her life as a missionary here in this jungle! As we look back on this year, and all that the Lord has done for us, and for this mission that He has called us to, we are encouraged that He is leading and guiding us every step of the way! John Newton wrote, “He who has helped me hitherto will help me all my journey through.” We are so certain that with all that God has brought us through so far, He will continue to lead us, guide us, care for us and provide for us. What a comfort! I hope that you know His comfort and help as His child. If you do not, seek him out! His gift of coming to earth as a baby and purchasing our salvation through His death is still the most wonderful gift ever given! He conquered sin and death and is our LIVING Lord and Saviour! What better way to start a new year than to start a relationship with the God of the universe as your Heavenly Father? May He bless each of you with His peace, and keep you in His loving hands. 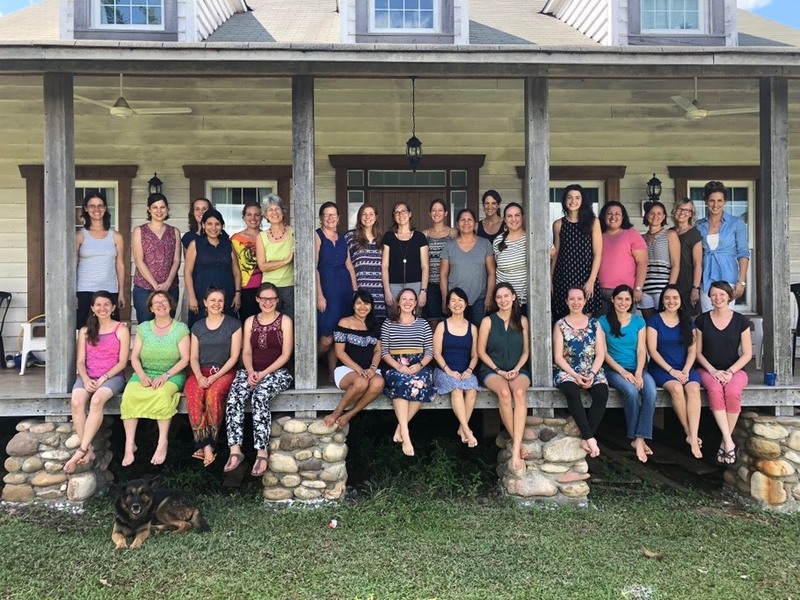 In the beginning of this month we hosted a missionary ladies retreat here, where thirty of us had a precious time of fellowship and prayer. I am so thankful to live and serve in a community where women lift one another up and encourage each other to keep the faith and continue in good works, even when we are weary. 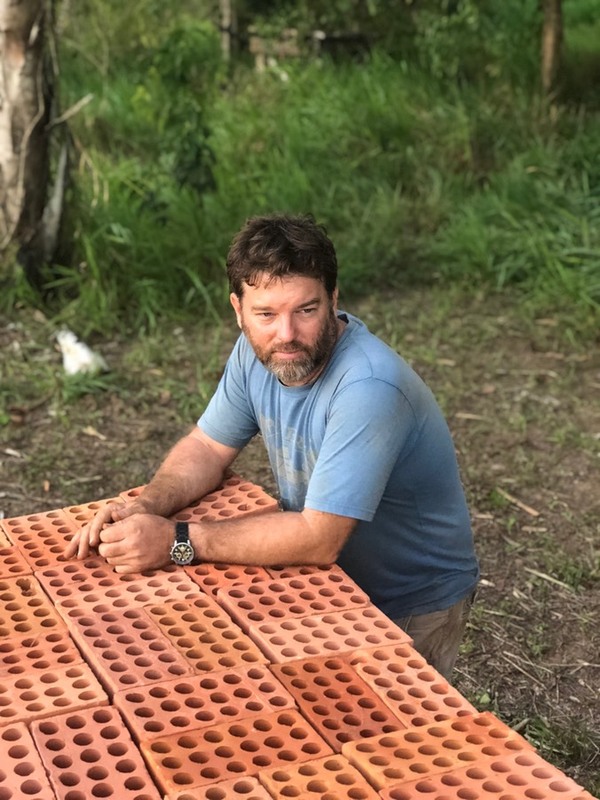 Vann was given the opportunity to fly out for a one-week trip to a remote Matses tribe on the Brazilian border to help a young missionary couple begin construction on their house, design a solar power system, and figure out a plan for clean water supply before they move out to the tribe in January. As you might remember, Vann had been struggling with a kidney stone for the past month and a half, but he felt that as much as he pushed through here at home to continue working, he could push through, and work out there just as well. 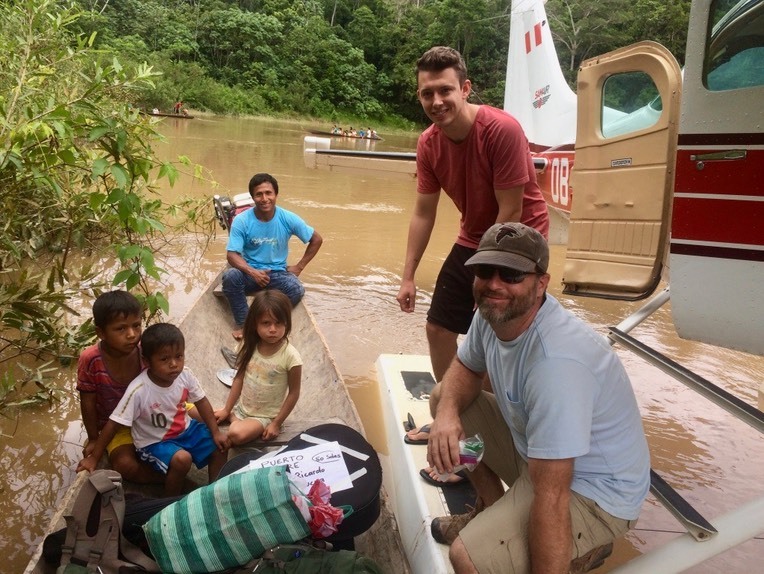 The floatplane flight with SAM Air (our neighboring mission) went well, landing them in the river an hours boat ride away from the village. We had scheduled a time when I would call the only solar-powered, satellite phone in the village before the sun went down that day to confirm their safe arrival. Everything was great! The tribal people gave them a super warm welcome, and they were well cared for with a hut to sleep in and food to eat. I awoke the next morning to an emergency call saying that Vann was not well, and I needed to call them back asap. I had no way to call them because our internet was out, and Vann had just used the last few seconds of another person’s phone card to call me since the phone cards he had purchased for the village solar satellite phone didn’t work, so they now had no way of calling out, or contacting anyone in the outside world at all. Nothing is easy. I made a hotspot on my cell phone to connect the computer to call them on Skype, to find out that Vann had been up since 3am with emergency level kidney stone pain, so they were asking for a flight out. When I called our dear friend and chief pilot to see about an extraction flight, I found him in terrible pain from having injured his back the day before. 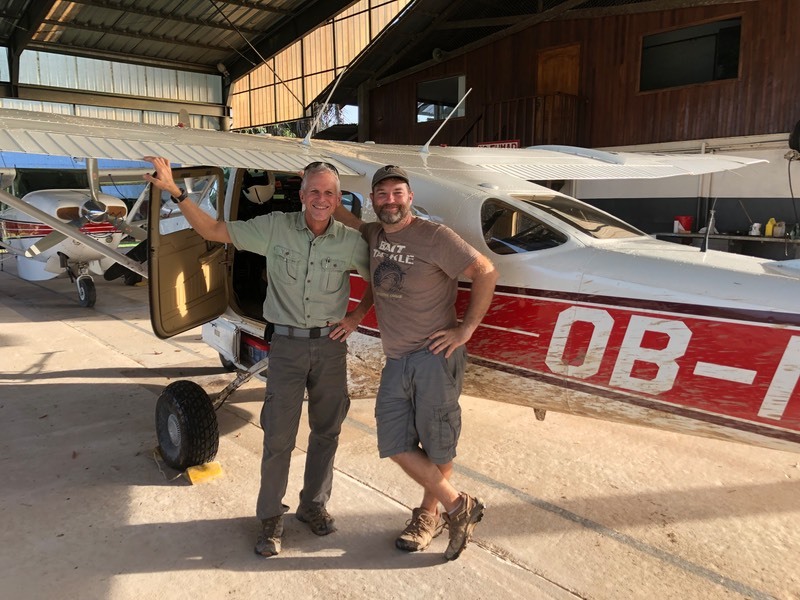 After he had dropped off our boys in their destination river, he had rerouted to pick up another missionary from a village an hour or so away, and the plane would not start again. They searched the village for some batteries to jump the plane’s engine, and thank God, were able to take off, and make it home safely. Now, the only plane and pilot that could go get them were both out of commission. Oh, and did I mention that the rainy season has begun, so the weather is dicey every day for flying. 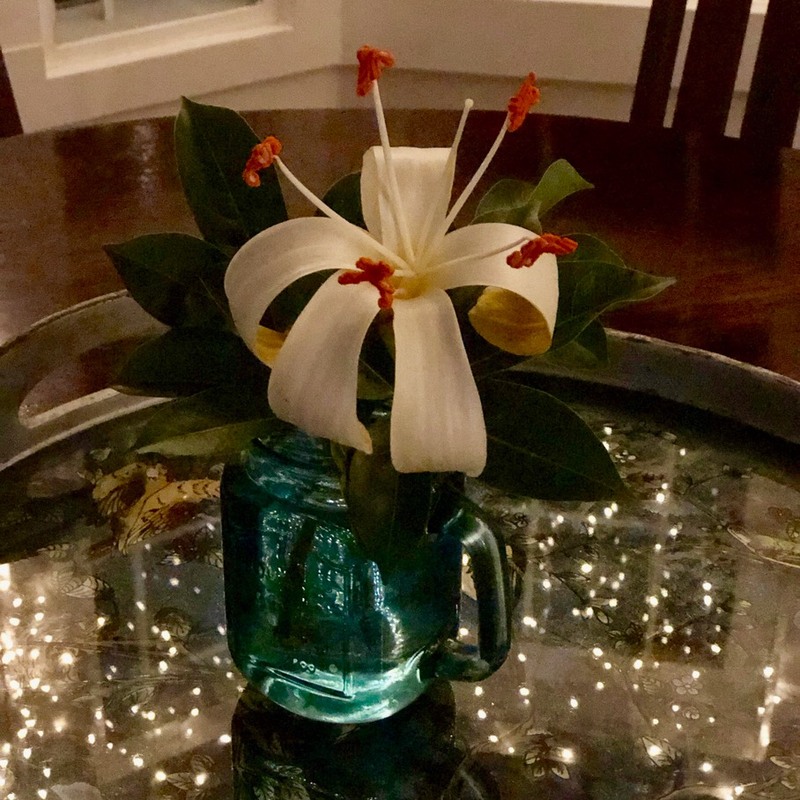 With much prayer cover, God’s amazing grace, and a lot of pain pills, Vann was able to wait it out and ended up coming home on the scheduled flight six days later. Two days after he got home, he passed his 7mm kidney stone! Thank God! The Lord blessed their time out in the tribal village with much progress, and plans made. 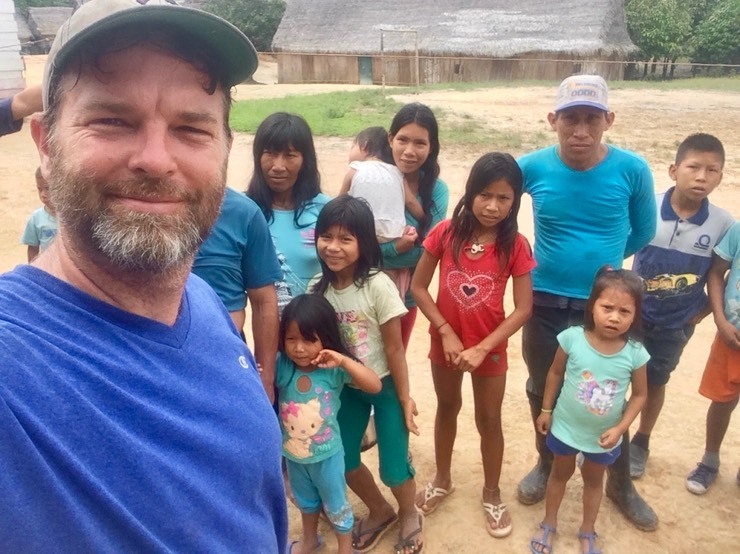 The coolest thing about this experience for us is the simple fact that Vann is enjoying doing the work that he began 25 years ago as a missionary to missionaries, especially tribal missionaries: helping them in their church planting efforts in technical ways. 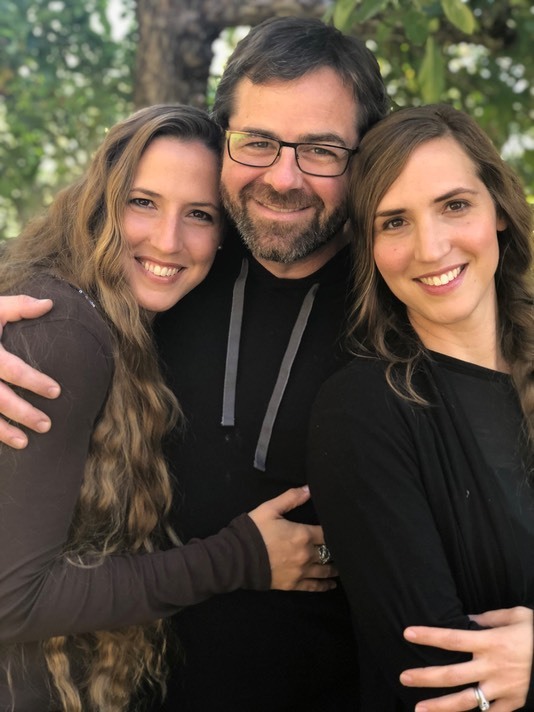 They’re awfully good at teaching and preaching, and Vann is awfully good at building and fixing things to enable their mission work, and life in the field. We are so thankful to get to do this job! The same day that Vann called out for a flight in extreme pain, I got another blood clot in my leg, so that was a nice addition to the stress and pain. It’s just a superficial vein, and I’ll be fine, but it was the timing that made it a little hard. 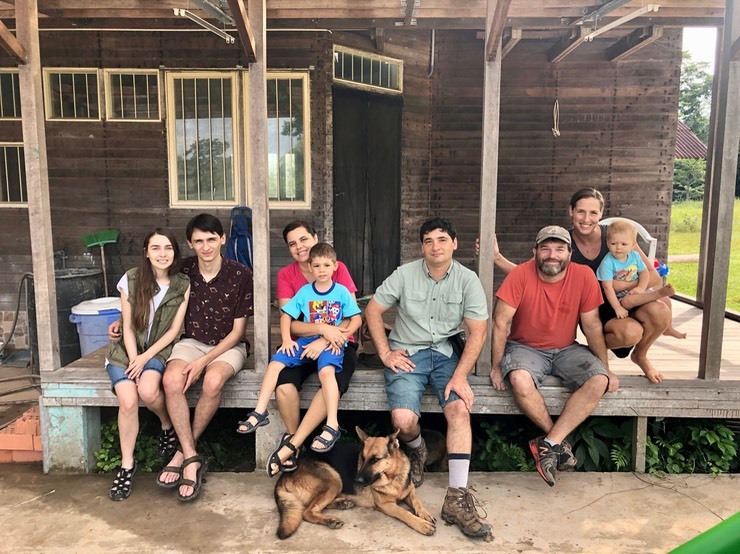 Also, that same morning the Dumitru’s called out from their tribal village asking for prayer for Marc’s injured back, and for rain so that they could have drinking water. It all seemed to be just a bit much for me to handle in one day, but it wasn’t too much for God! I sent out the call for prayer, the saints got on their knees, and God answered! That night was the biggest thunderstorm ever. It brought with it plenty of rain, and Marc’s back was soon on the mend. Thank God! 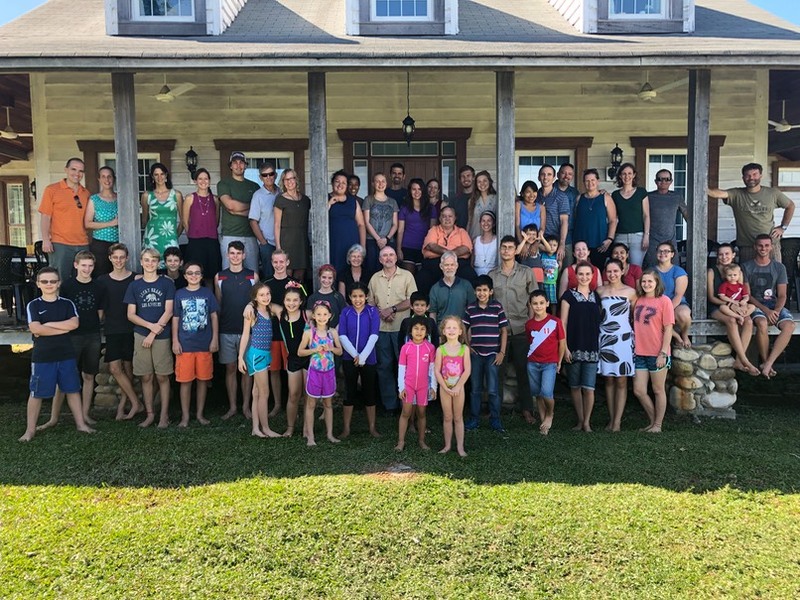 This year Thanksgiving was an epic experience for us as a family, with 64 missionaries gathered in this beautiful mission house. We all ate on the wrap-around front porch, and in the dinning room, and enjoyed a sweet time of thanksgiving and worship in the living room. It felt like home. Like a huge family gathering for the holiday, because that’s exactly what it was! We are so thankful to get to host Thanksgiving in this house with these precious, fellow pilgrims! Thankfulness hardly describes the depth of gratitude that we feel for the blessing of each of you who make this mission, and our lives here a possibility. From those of you who so faithfully and sacrificially give, to you who pray for us to keep us lifted up and strengthened, and those of you who reach out with a kind, and encouraging word – Thank you. May the Lord bless each of you as you follow Him, and walk this road with us. It is usually the missing that gets to us. I’ve said it before. 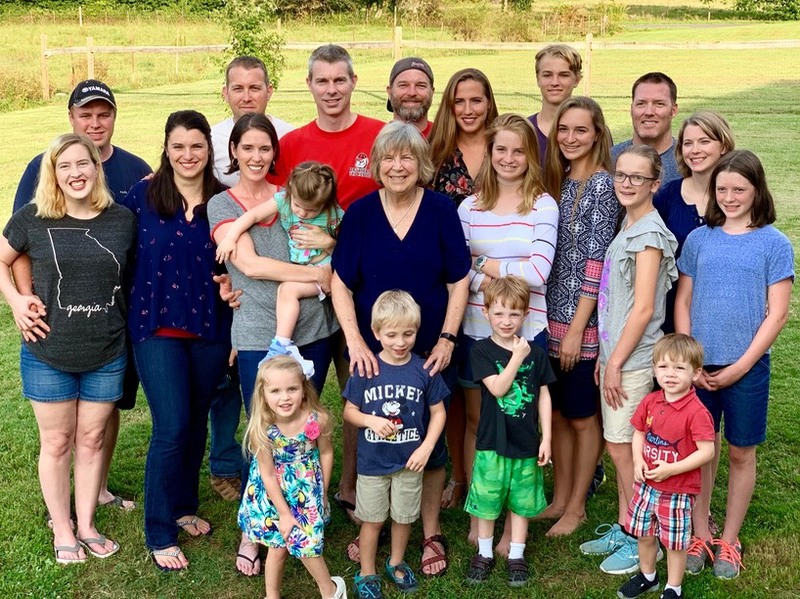 Missing the family gatherings and happenings over the years just seems to get harder as the years go by, and I cannot imagine how that will compound when our own children will live on another continent, but I get ahead of myself. Earlier this year I received two invitations to two different family events, one on each coast of the United States, within a week of each other. 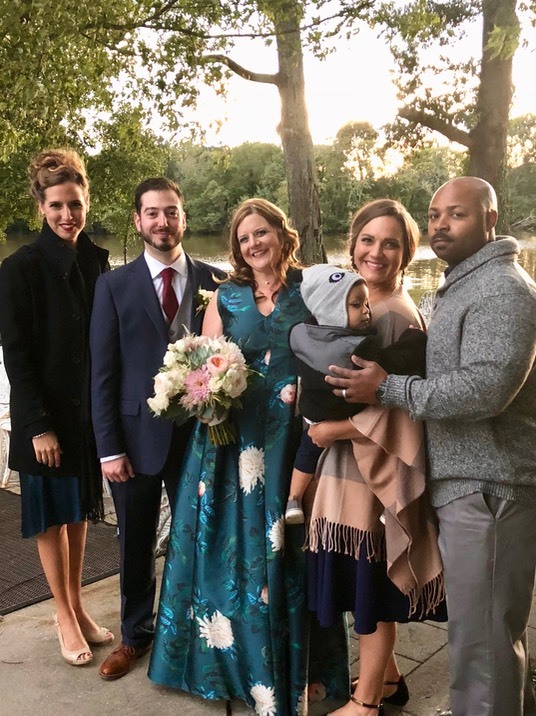 One was a family reunion in Oregon, hosted by my twin sister, to commemorate the twentieth anniversary of our father’s death, and the other was a wedding in Maryland. Oh, how I wanted to go to both events, and couldn’t bring myself to go all of the way to one without going to the other. So, we finally decided to try and get me to both, with faith that the Lord would provide. My mother’s flight privileges from her retirement from the airlines allow me to be able to fly standby at a significantly lower rate when I travel alone, but even with the savings, it was still going to be a stretch for us financially. The very day after we purchased my tickets, we got a phone call from a dear friend informing us that they were going to pay for all of my flights! Why is it, that even when we know that it is God who provides our every need, we are still surprised when He does! Boy, that just took so much of the stress away for me, and I was able to enjoy the trip so much more knowing that the Lord had paved the way. I ended up taking twelve flights in fourteen days. Even flying standby, I arrived at each event and made it to my international flights all on time! I pulled a few 36 and 48-hour stints, but the Lord upheld me. 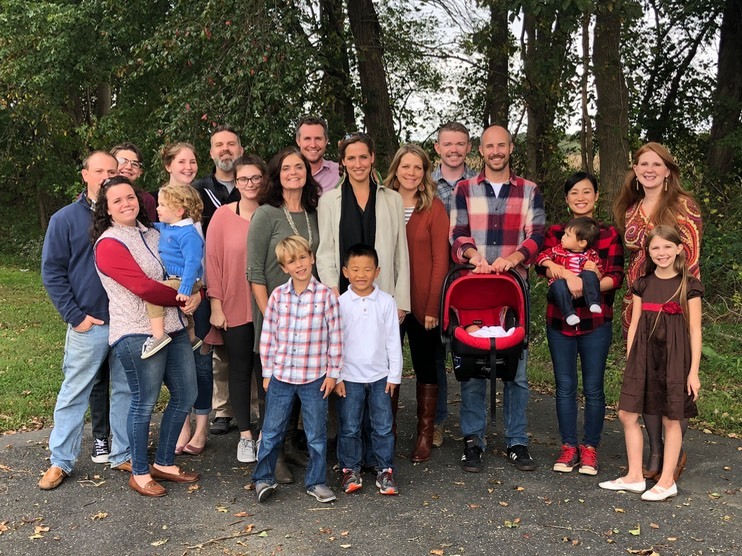 One of the highlights for me, other than the planned events, was attending my home church in Maryland after the wedding, and getting to worship and fellowship with my church family. It was from a few precious people that handed me some gifts throughout the trip that ended up covering all of my other trip expenses! So crazy blessed. I got to see so many loved ones, and I will treasure the memories for the rest of my life. 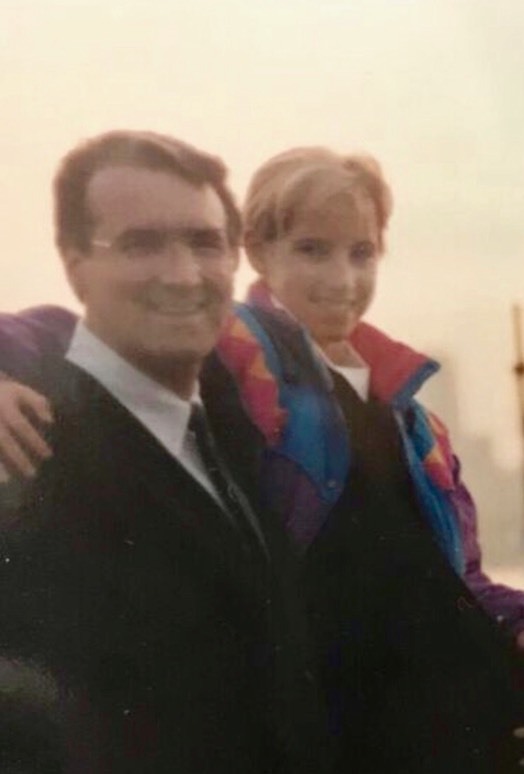 It is a profound thing to think about the impact that one life can have, that even twenty years after his passing, so many would gather from all across the country to remember Daddy together. 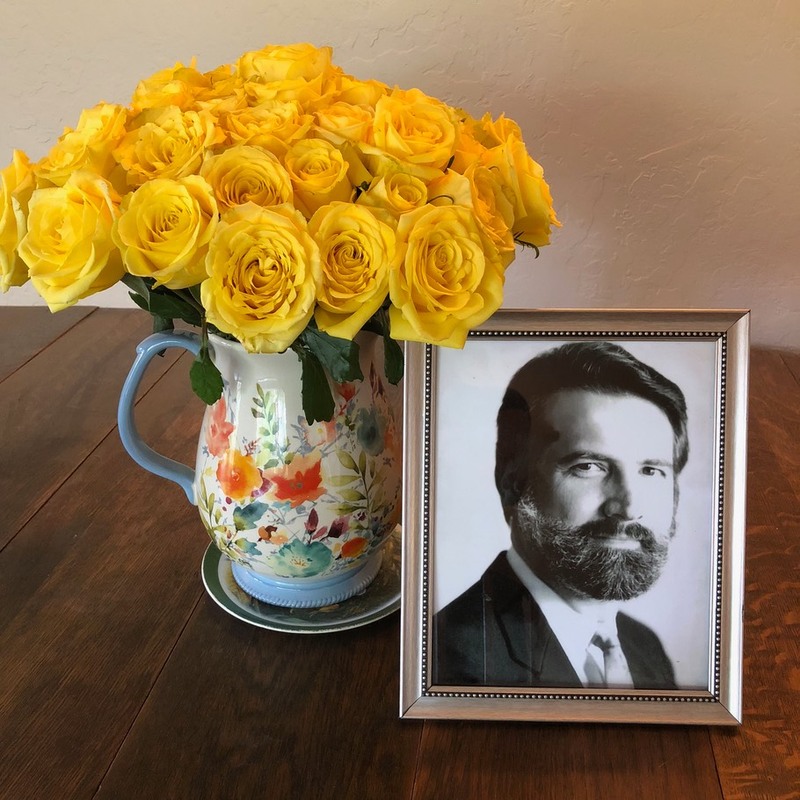 At the memorial, we enjoyed hearing his testimony from a restored VHS tape, reading letters that were sent in from friends and family that could not attend, and sharing our own memories. The one, prevailing theme was how very much he loved Jesus. He was a great man because of his love for Jesus. We have hope that we will see him again because of his love for Jesus. It is really all about Jesus, and not about him or us at all. It is only our life in Christ, and what is accomplished in His name and for His glory that will last. While I was gone, Vann held down the fort rather well! I missed Clara’s 12th birthday, Corynn and Ethan’s high school homecoming, and spirit week at Sam academy. Vann kept everyone fed and to where they needed to go on time, and managed all of his projects on the base at the same time, all while massively struggling with the pain of a kidney stone. This is the same kidney stone that I mentioned to you last month. I forget how very hard this is – it can only be equated with labor pain. Can you imagine being in labor for a month? And continuing to work, and relate to people with kindness – he is truly an amazing man. Please pray with me that this stone will pass, especially before he travels out to a remote tribe to help a young missionary couple set up solar and water for their tribal house next month. Corynn got braces put on just the day before I left, so that was painful and the timing was a bit traumatic, but she’s a tough cookie, and handled it all with grace. 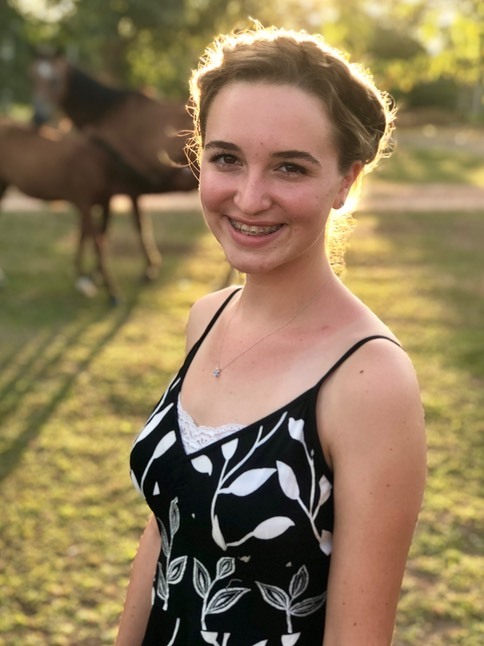 She has also volunteered to sing at church occasionally, which of course makes us very proud that she wants to use the time and talents that God has given her for His glory! 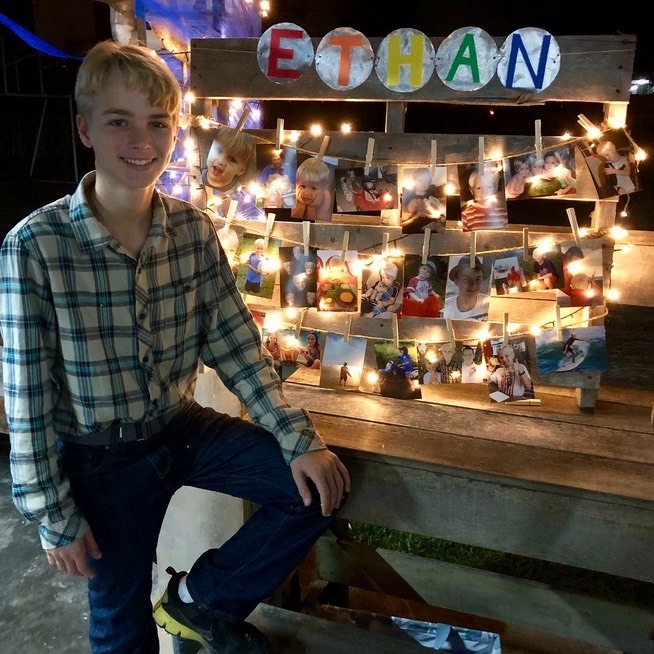 Ethan got to go to his first homecoming as a high school freshman! He is just about to pass me in height, and continues to astound us with the abilities God has given him. 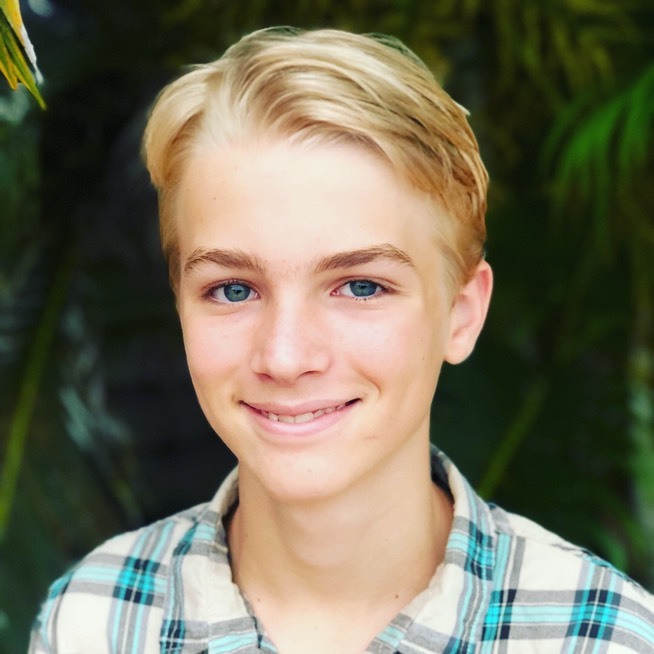 We are so enjoying this teenager stage with all of its blessings and challenges! 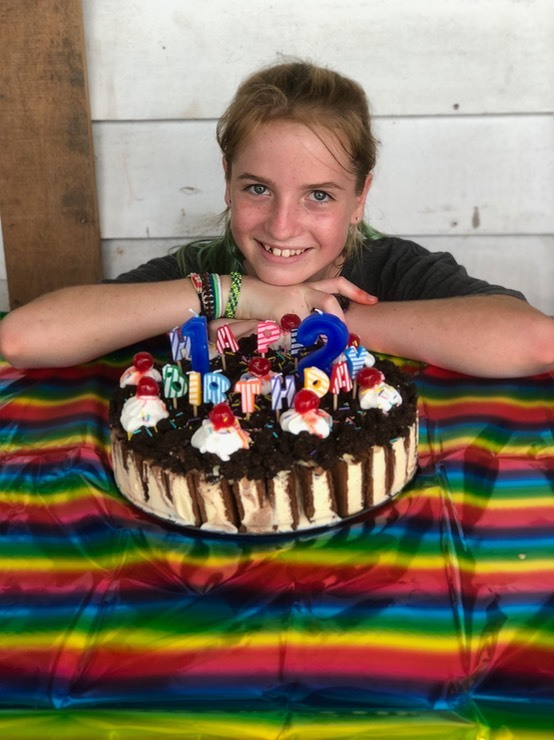 We celebrated Clara’s twelfth birthday again when I got home, and had a fabulous time! She is such a bright spot in our lives. She is a very deep thinker and she loves Jesus! It is a bit surreal that our baby is so grown up. 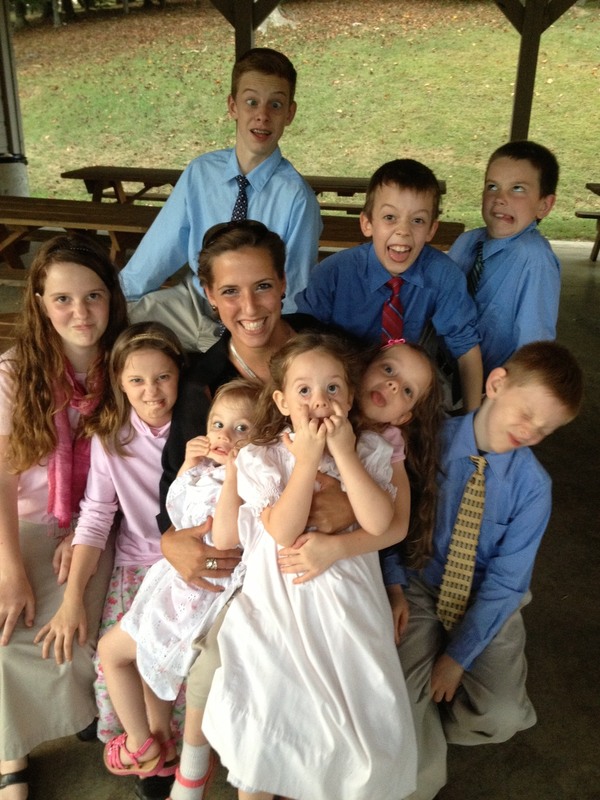 In the midst of all of the travels, kidney stones, and family events, there have been ministry opportunities too! 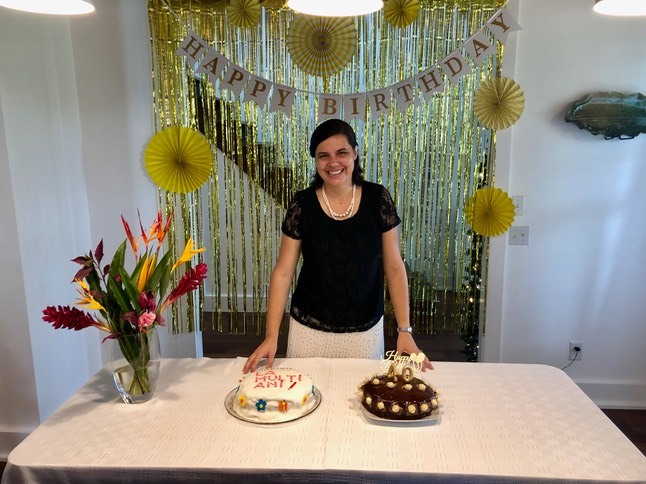 Vann has spent some considerable time working on other missionary’s computers, repairs in their houses, researching solar systems for their mission bases, and loving every minute of service to the saints. 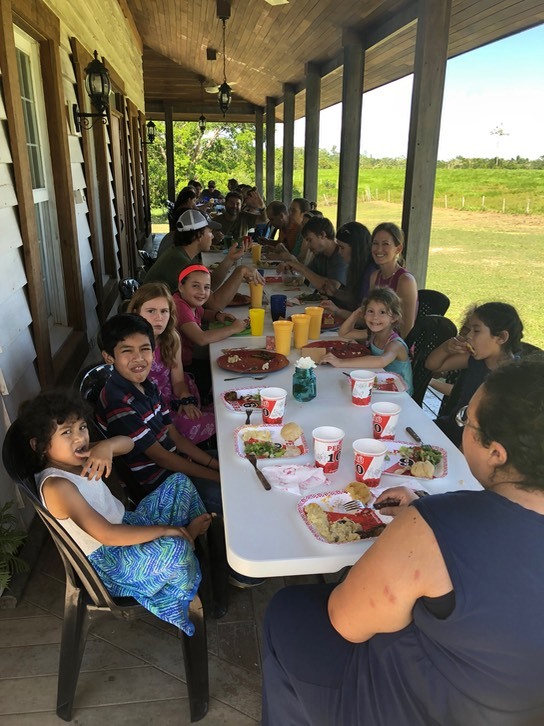 We have had the distinct honor to house a dear missionary family that work out in a tribe near the Brazilian border while they came out to town for medical help. 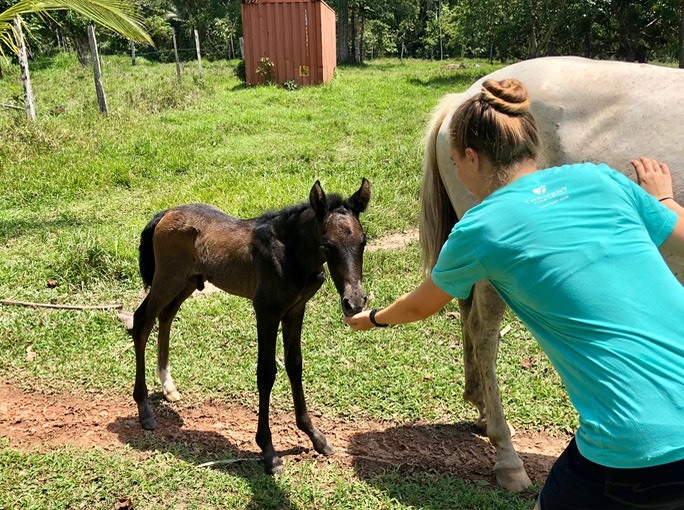 Please pray for healing, as they are quite certain that it is Leishmaniasis (a flesh-eating bacteria, common to the area where they work), and the treatment will be brutal. 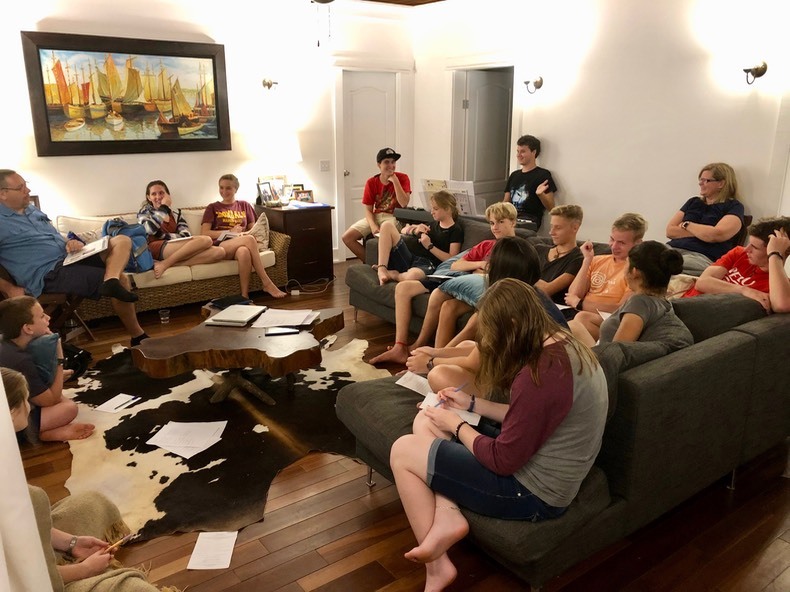 Youth group is a joy to host and a pleasure to participate in as we witness the growth and maturity in all of these precious missionary kids! 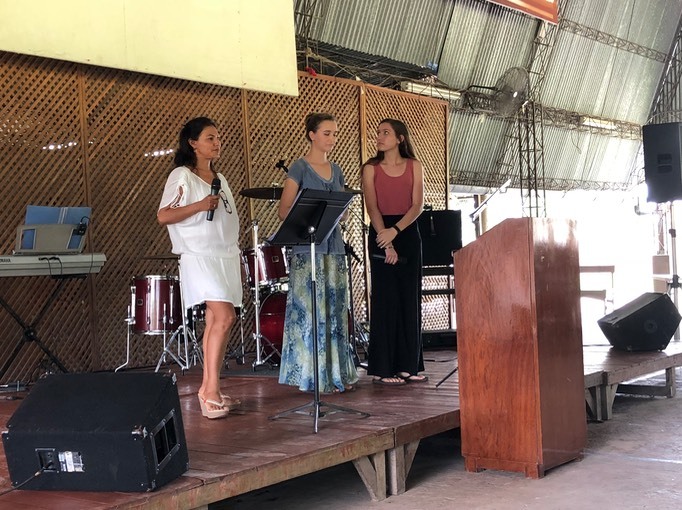 Please pray that they will learn to love Jesus more every day, and be able to stand firm in their faith when they eventually graduate, and leave the safety of home for studies in their home countries. An old friend of ours from our first years living downtown showed up one day and just stayed out here with us for a week! He is one that we’ve been caring for and discipling for a long time, so it was super nice to have a condensed period of time with him. Please pray that the Lord will do a great work in his life. In light of all that God has done, and is doing through us, we remember that it is not about us at all. To God be the glory, great things He has done! We are profoundly grateful for all of you who support us financially and in prayer. May the Lord bless you abundantly more than you could ask or think! I got to meet my newest nephew!!! Isn’t he darling? 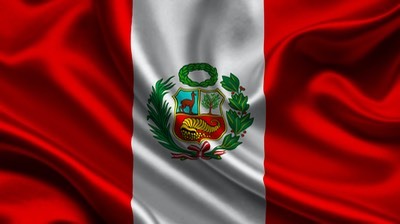 The Lord has seen fit to allow us to live and work in Peru for fourteen years! As time usually does, it has flown by. It feels like it was just yesterday, and on the other hand like it feels like it should be so much more than fourteen years! We are so very grateful for the life and ministry that God has blessed us with here in Peru. 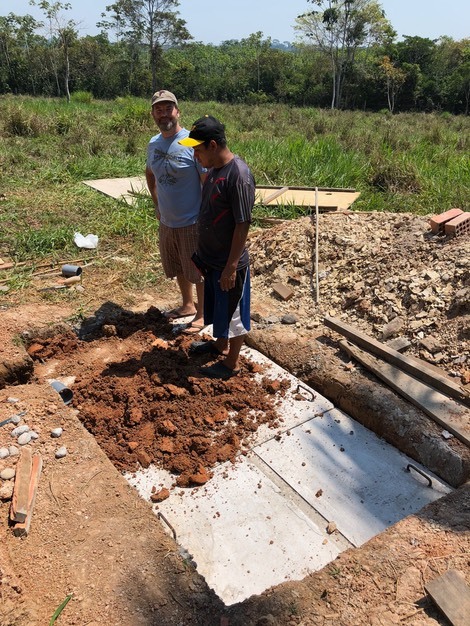 Vann has been busy still working on the septic systems for the camp bathhouse, pool bathrooms and the mission house. The camp bathhouse has a roof on it, and is ready for stucco and to be trimmed out with its fixtures. This month has been full of hard labor in the scorching sun, but the Lord has sustained him, and I am so proud of him. For some reason, after nearly a year without a kidney stone, he is suffering with another one this week. Please pray for him, that the stone would pass quickly and as painlessly as possible, which would be a miracle! 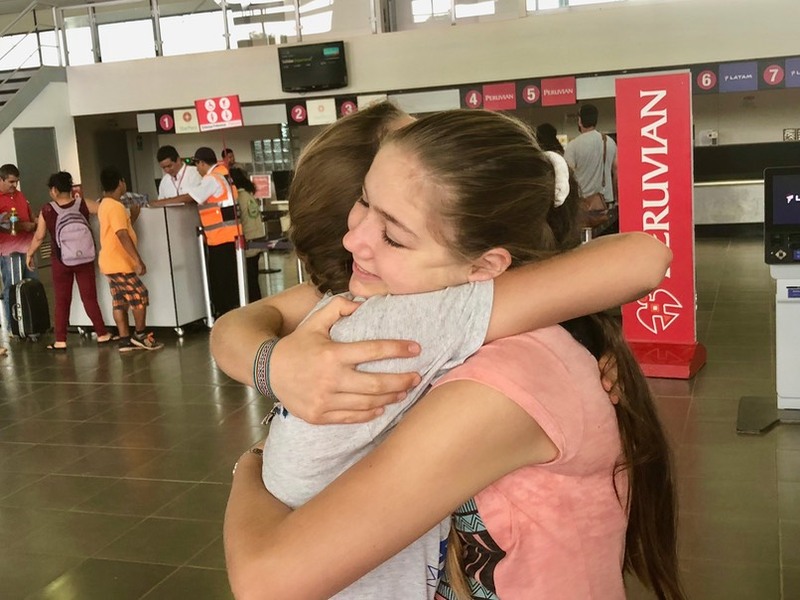 The Dumitru’s are home from their furlough in Romania! 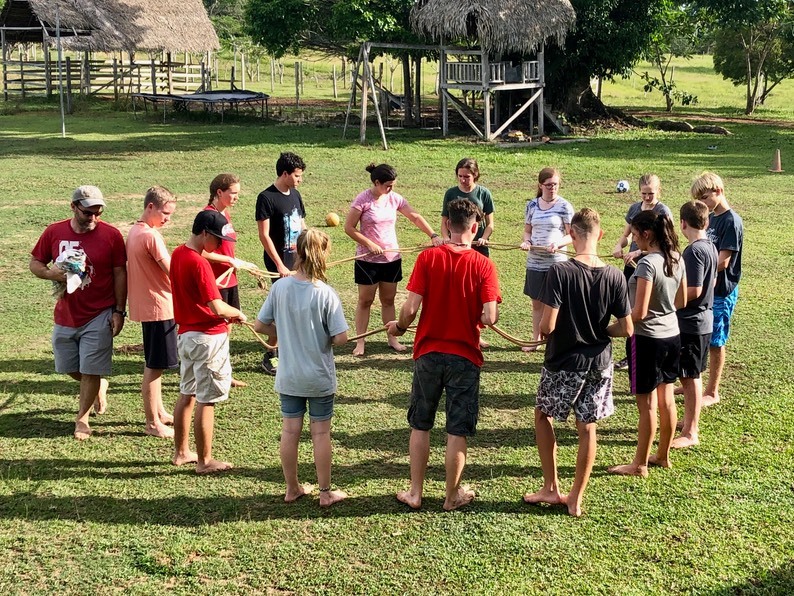 It is part of our ministry to support them in their tribal mission, so to be able to do little things like clean their house, stock their fridge and cut the grass for them before they come home is super fun! We are so blessed to have them living here, and be our neighbors. It was our honor and pleasure to help another missionary family as they are preparing to leave for some time in the States. They live the farthest away from us of any missionary in this town, and happen to be some of our closest friends. 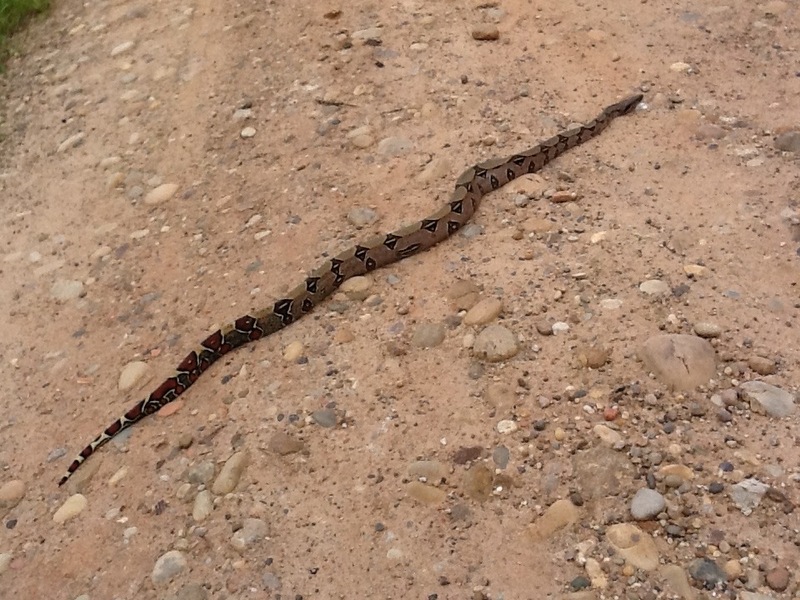 They have just moved into a new house with a garage that did not have a door installed on it yet, so it was not in a secure state to be left for a long period of time - not to mention all of the critters that would love to make the garage their home for the next few months! So we spent several days this week going over to install the door for them, and loved the time we got to spend together in the process! The Petra pool has been full this month in this massive heat wave that has seemed to come through and settle down over our heads. There are of course the usual young families that come on the weekends, but we’ve also had swim classes from two schools added to the happy swimmers! There have been several people with various ailments that have consistently come to the pool several times a week for therapy. They have lovingly coined it the “Pool of Bethesda”, as they come with the hope of healing especially since I am a walking testimony of God’s healing hand through this pool. Praise God for His willingness to use this mission pool to bless and heal! The mission house has stayed busy and full too! Prayer meeting was held here again, which I’m sure seems repetitive to say, but it is such a joy for us to see this house used as a house of prayer, and a service to the saints. I had a young, new missionary call and ask if they could come out for a day since word was that we take in weary missionaries, and offer rest and refreshment. Yes! That is exactly the case! What a privilege. 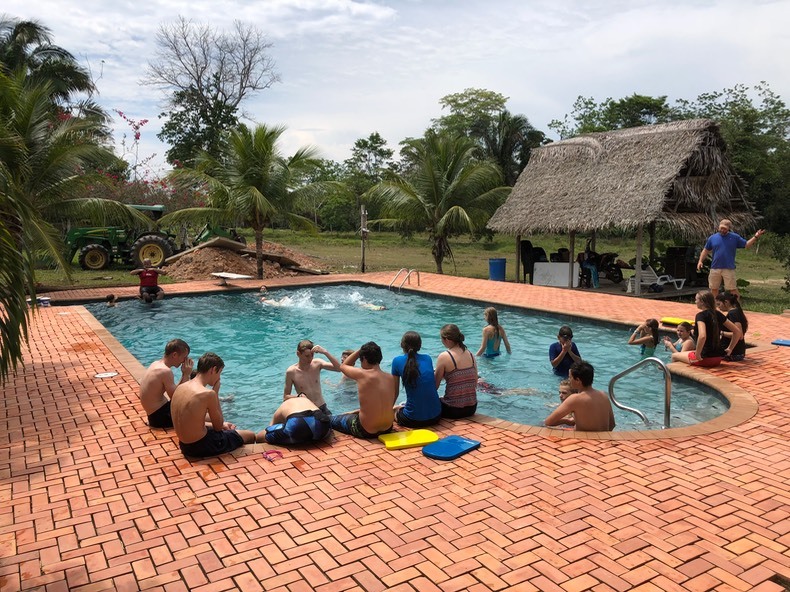 Our children’s mission school’s youth group has also been hosted out here with Vann leading games, and the pool and grill playing a significant part of the fun as well! 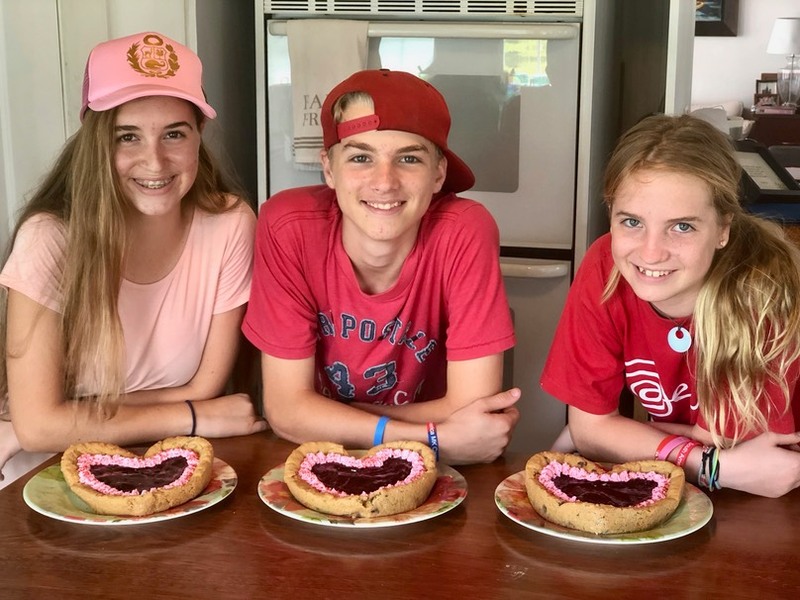 We are so grateful for other missionary parents’ willingness to pour into our kids lives, teaching them at school and in bible studies, so it is our privilege to contribute something to this precious community of missionary kids! Speaking of which, I’ve begun teaching a handicraft class to some of the young girls that live on our road. They are such a delight to teach and spend time with. It doesn’t even feel like a class to me, I just love doing this kind of thing so much! Another project we’ve been putting some time into is researching the possibility of installing a solar panel grid tie system to help us with the expenses of running this base. The electrical bill for this whole mission base is rising to the point where we will not be able to continue to foot the bill alone, so a solar system seems to be a wise move. If any of you have experience with these kinds of things, and would be willing to help us, we would be so grateful! This is going to cost a pretty penny to purchase, import, and install, so we would welcome any help! Above all of the hard things that come with living as immigrants in a foreign country, we feel so blessed to be able to live here! 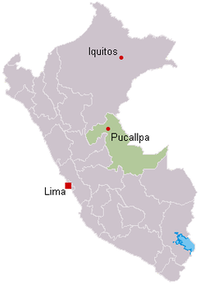 We love our Peru, and we love the people that we’re blessed to serve and live with. Thank you all for praying for us and supporting us in this amazing mission that God has sent us to live out. This is the purpose of our lives, to tell the world about Jesus, and how much He loves them. We couldn’t do any of it without you and we certainly couldn’t do any of this without God’s amazing grace every moment of every day. School is back in session! 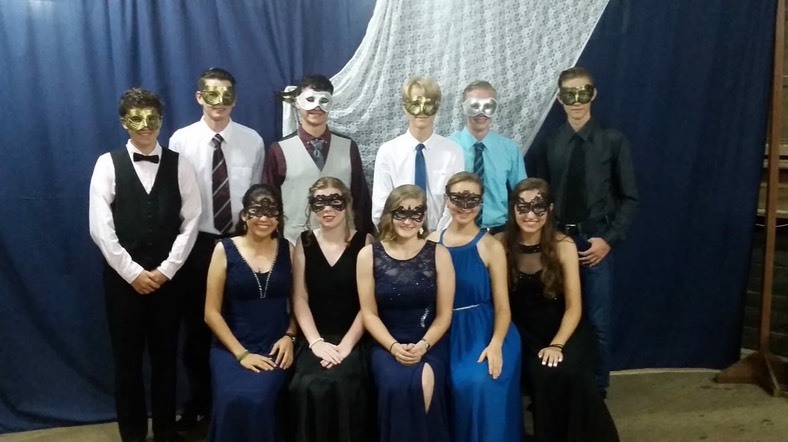 This school year finds us with two kiddos in high school, and one in middle school at South America Mission Academy. I think that I blinked somewhere along the way, and all of my babies are grown! Ethan and Clara have grown so tall since Christmas. Ethan is very proud of having passed Corynn up, and keeps reminding me that he’s almost taller than me! 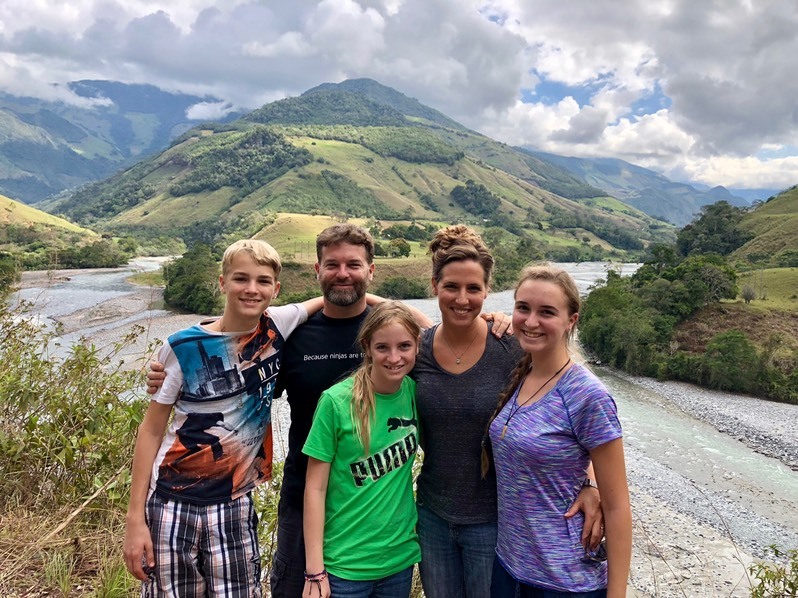 Just before school started we had the opportunity to go on a road trip with some of our dearest friends to a high jungle town called Pozuzo tucked in the foothills of the Andes. 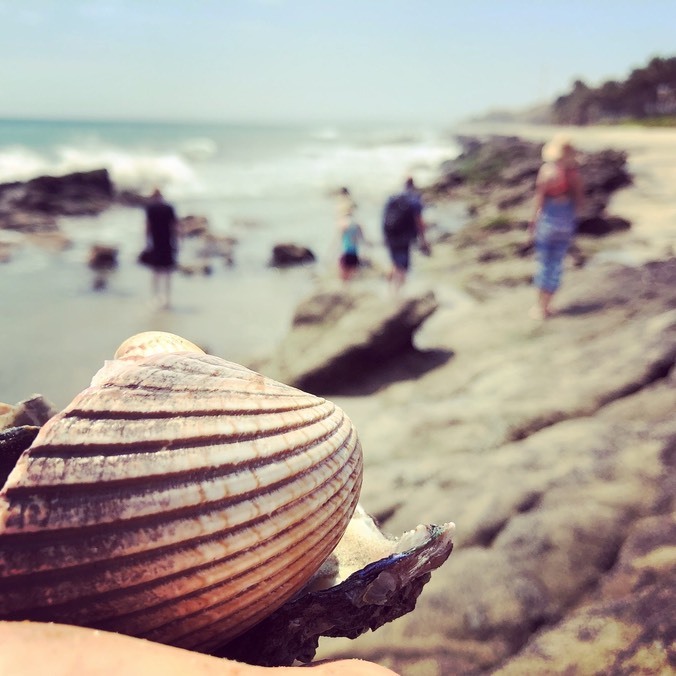 It was a quick, weekend trip, but it worked wonders for us to get out of our little world here in the basin, and see, in my opinion, one of the most beautiful places in Peru! 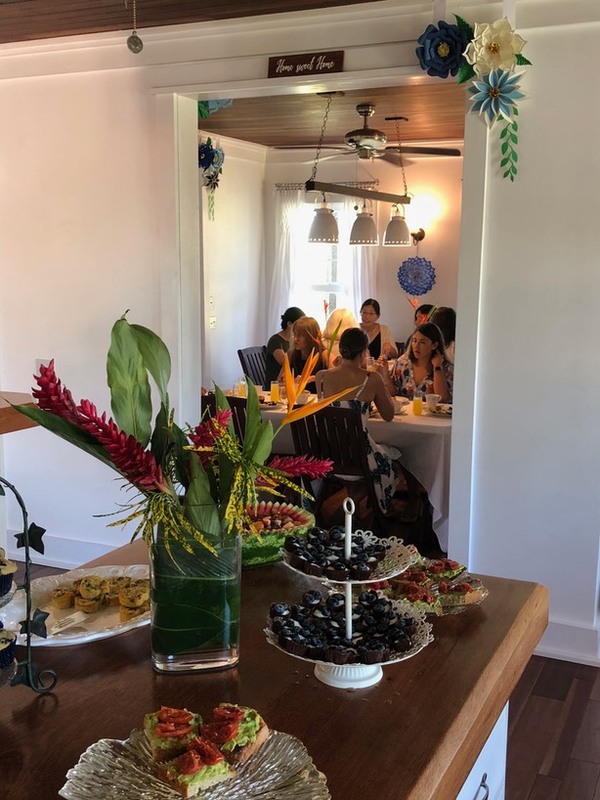 We were honored to be able to host a bridal shower brunch here for the daughter of a dear missionary friend. We’ve known her since she was a little girl, and have had the privilege of watching her grow into a beautiful, Godly young woman! She was a part of my etiquette class years ago, and she allowed me to do her hair for her wedding! What a blessing it is to have young people to whom our children can look to and hopefully follow their example! 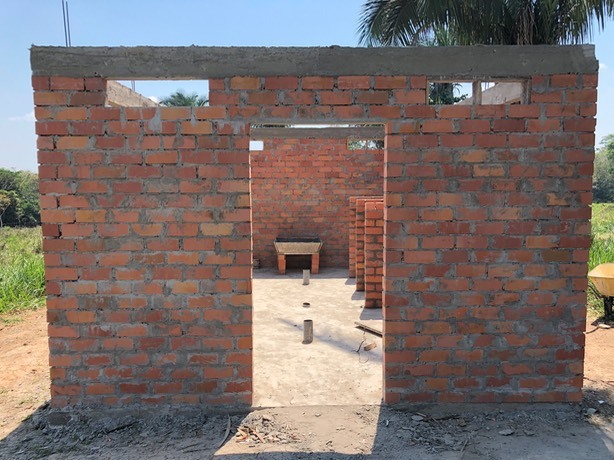 We are so excited to be making progress on construction for the Petra Camp! Starting out small, but mighty, Vann is building the first bathhouse. This will be for the girl’s side of the camp eventually, but will have to serve everyone for now. 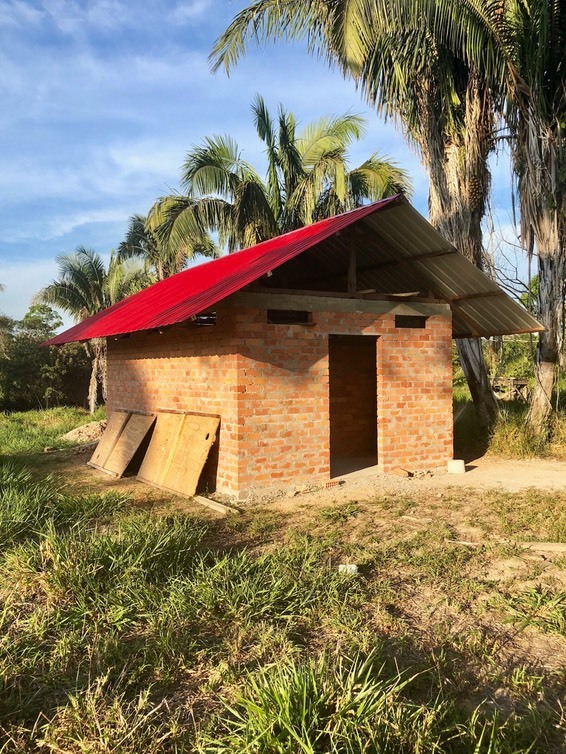 You’d think that it wouldn’t be much of a deal to build a bathhouse, but in order for it be functional, we also need a well for a water supply, and a septic system, so that is what he is currently working on. Trying to take advantage of the dry weather, he’s pushing himself a bit too much in my humble opinion. He’s still not 100% back from his bout with pneumonia, although much better, digging out septic systems and pouring concrete is hard labor in this scorching sun. It’s hard on his health, and hard on his shoulder. Just telling you how it is, but he’d be sure to tell you that he’s doing great! I am so grateful to be on this mission with my man who is so able with his hands, and faithful to use his gifts for God’s glory. 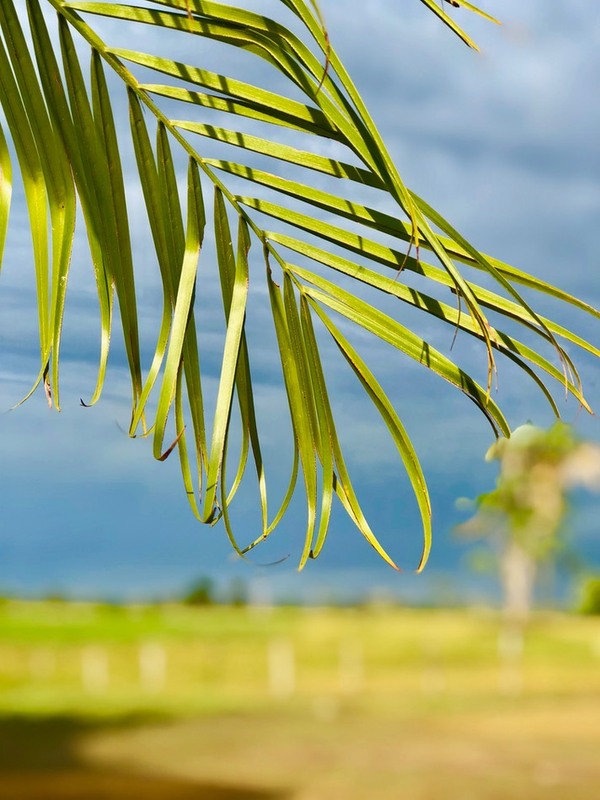 He is trusting that our limitless God will work through him to build this mission base and camp, and give us the grace to host and serve the many people that come to be refreshed and loved. Every weekend, and so many of the days in between have been full of people; singles, couples, families and church groups coming for the pool, fellowship over a meal, or just needing a safe haven to unburden and talk in a loving environment. Vann has been on call for internet and computer repairs, other mission’s supply buying, running new electrical circuits in old houses, and is so pleased to help when people call with construction questions, planning, or figuring. It is such a joy to serve the saints that work beside us, and an honor to minister to our Peruvian friends, brothers and sisters! We often feel like the physical, emotional and financial cost to do this mission work is just so much, but our God is faithful to continue His work in us and through us on a daily basis, and He always provides everything we need! His grace is limitless! We are massively grateful to all of you dear ones for your faithful support and prayers for us, without which we could not do this work that God has called us to do. Many, many thanks, and much love! People. You have so literally and powerfully taken our needs to the throne of God that we have seen and felt the effects in a mighty way. The last update that I sent out was a cry for help in praying for my Vann. He was so sick. His lungs were gurgling with every breath, and there didn’t seem to be any improvement in his days, until we asked you to pray. The very next day he turned a corner, and has been steadily improving since then! His lungs started to dry up, and he was noticeably stronger – able to work a little longer every day. We’re about a month down that road now, and he is nearly well. His lungs are clear, the horrid cough is gone, and he is at about 75% with his energy – which is amazing! Thank you so very much for lifting us up to the throne of our great God! The dry season has finally seemed to set in giving us an opportunity to advance on the camp and mission base projects! Vann has poured a slab for the poolside bathrooms and is working on the slab for the first camp bathhouse! All of the gravel and bricks have been delivered, not without trials – which is why we’re so grateful for some dry weather! 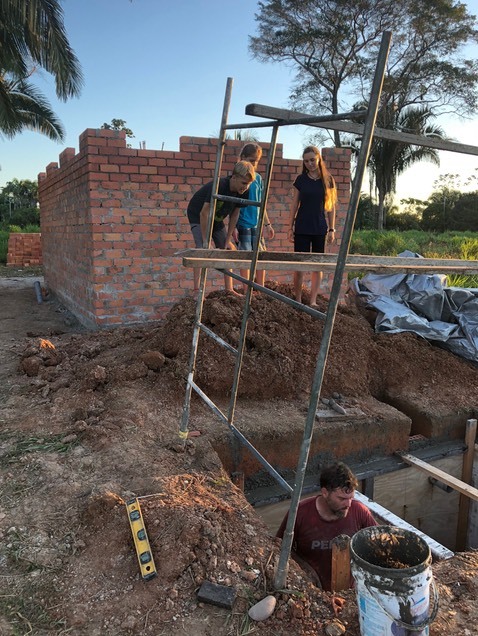 Next, he will need to dig and build the septic systems, which have to be specifically engineered for this area, and built from scratch of course. He has also been able to put some much needed attention towards maintenance for the fences and road. 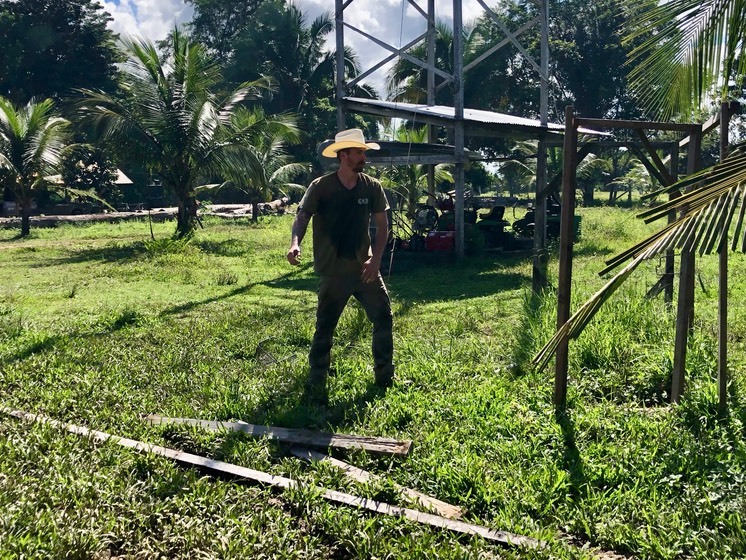 Maintenance is literally a full time job for this mission base, but alas, it is still just us here, so it’s a difficult balance between advancing on building projects, and maintaining everything before the jungle takes over again! We have had the opportunity to serve several large groups of people here this month! 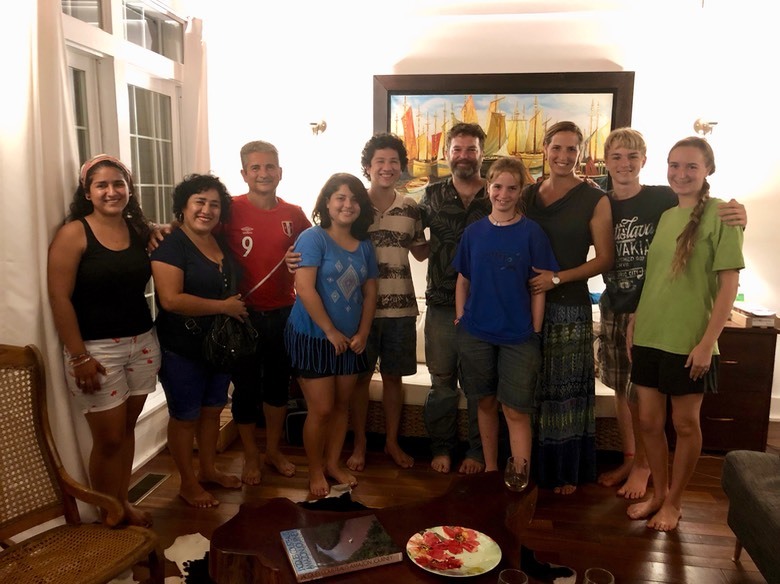 We hosted an open-house style July 4th celebration with a cookout, yard games and fireworks at the end of the day with about fifty people having come throughout the day. We love our missionary/expat community! My Peruvian mother, Aurora, brought her church’s ladies group out here for their retreat, and we just had so much fun! Nothing here goes as planned, and this day was no exception! 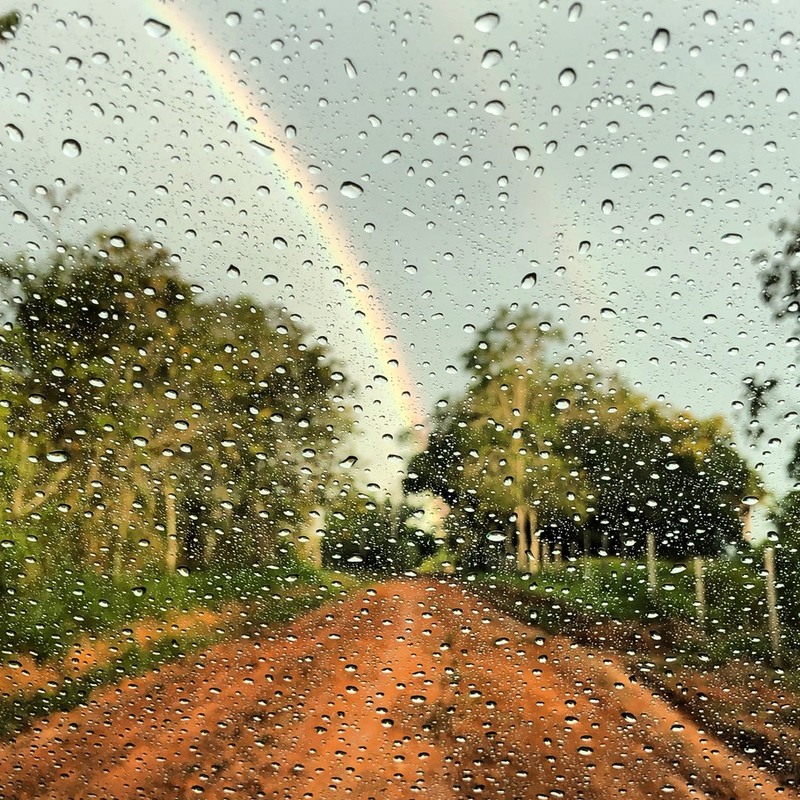 Even though this is supposed to be dry season, storms still blow through in big Amazon fashion, and that’s what happened the night before the retreat, and all the next day. So, even in the rain, these ladies were coming to their retreat. At 8am they arrived at the highway gate. They came in a large bus, as there were over 50 people (including kids and the babysitters), and all of their food and drink and luggage for a day out. 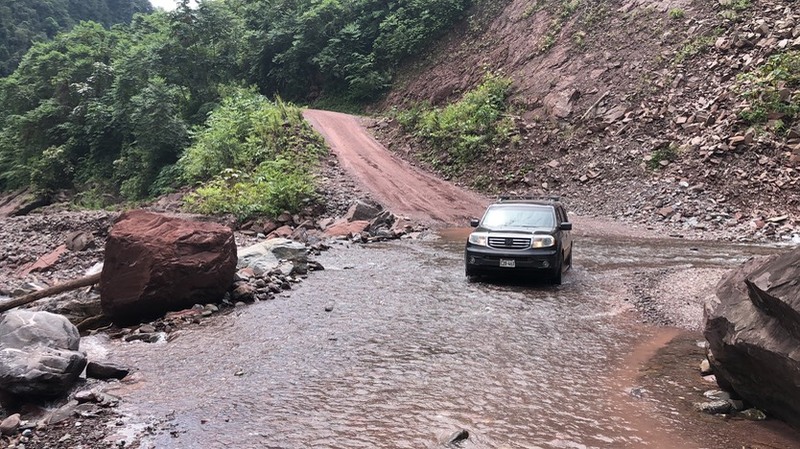 That presented a problem since the neighbors have an agreement that nothing larger than a family car or truck is allowed on the 3.5-mile dirt road between the highway and our house if it has been raining, as the heavy vehicles cause huge ruts and damage to the road when it is soft. So… we shuttled them from the highway to our house with two cars in three trips, and then back again at dark. 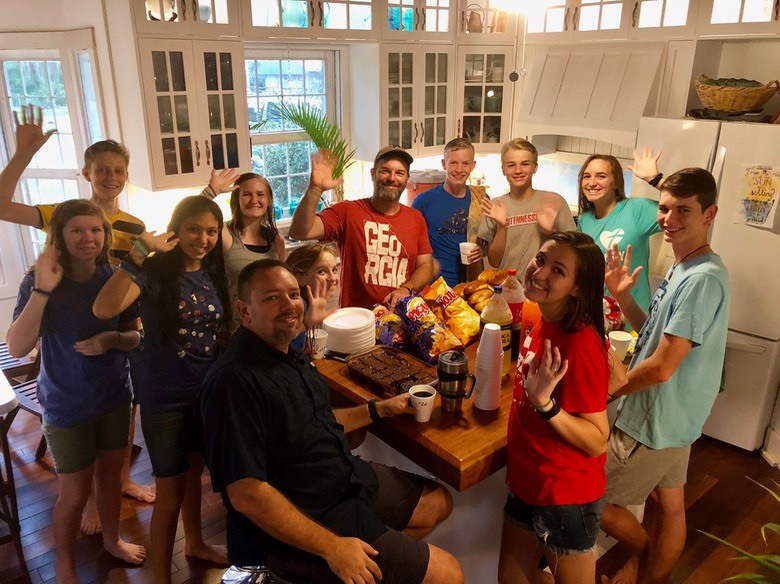 It was more work than we usually put into hosting groups, but it was such a blessing to have them here worshipping God in our living room while the kids played in the yard and the pool – in the rain! The other groups have been smaller, and have for the most part had their own transportation! 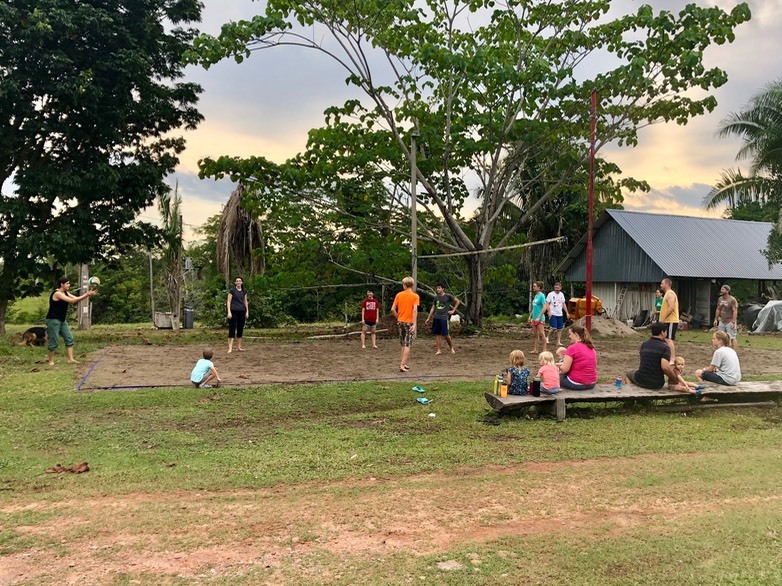 Small groups from church come to the pool after Sunday services, missionaries gather for impromptu volleyball tournaments, and many just come out on their own for some rest and peace and refreshment. There really is nothing like a glass of Southern sweet tea on a wrap around porch with a friend. 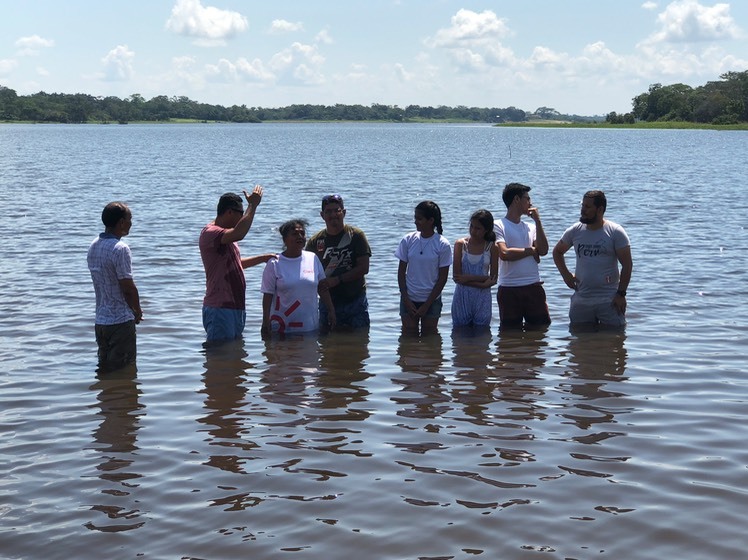 Our church has celebrated another baptism Sunday! 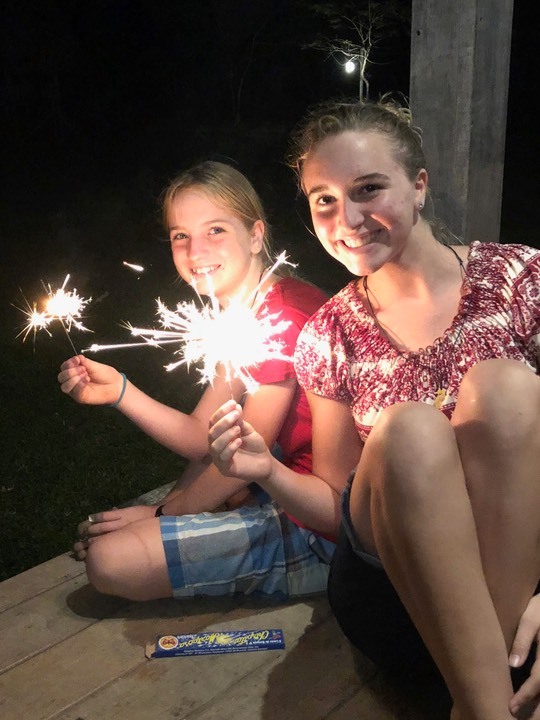 One of the girls that was baptized had just come from the neighboring youth camp in which Vann, Corynn and Ethan have been helping with every day this past week. What a joy it is to see this church growing in the Lord! God is doing big things like providing us with the health and finances to build this mission base. We just look at the precious faces of the nearly 200 people God has brought here just this month to be loved on and ministered to, and feel so blessed to be able to serve here! Thank you again for your prayers; they sustain us. Please keep it up! This month hasn’t gone like we anticipated, but it has been full of God’s blessings! Ethan graduated the eighth grade with the flu. The poor boy actually fainted out at the dinner table the night before, and could hardly walk down the isle to receive his diploma, but he did! We packed up and left the next morning for a family vacation and some time in the capitol city for passport renewals and furniture shopping. 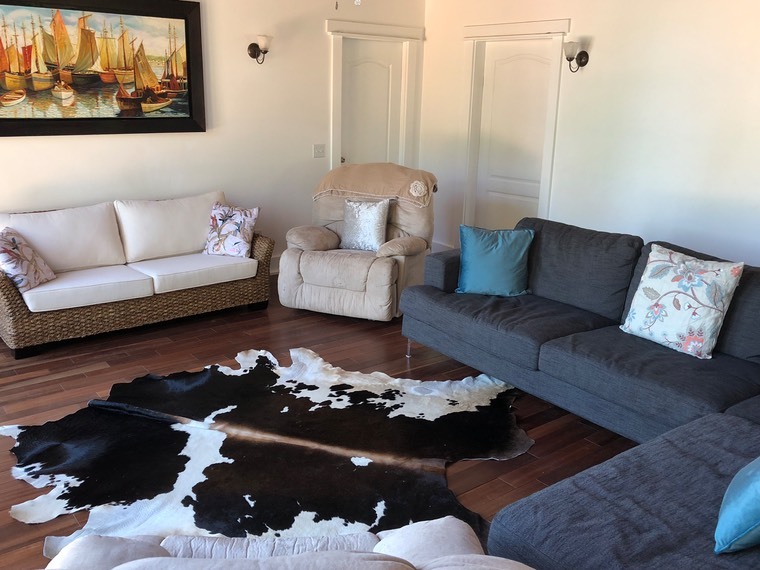 The living room of this mission house was in dire need of some seating, (we’d been using our plastic porch chairs) and the Lord provided some money specifically for furniture through some dear supporters! We knew the normal cost of sofas in Lima, and started praying for a miracle. In the last store that we visited, we found two floor model couches on final sale for the exact amount of money that was given. Praise God! We should always pray expecting a miracle, and knowing that no detail of our lives is too small for God to care about! 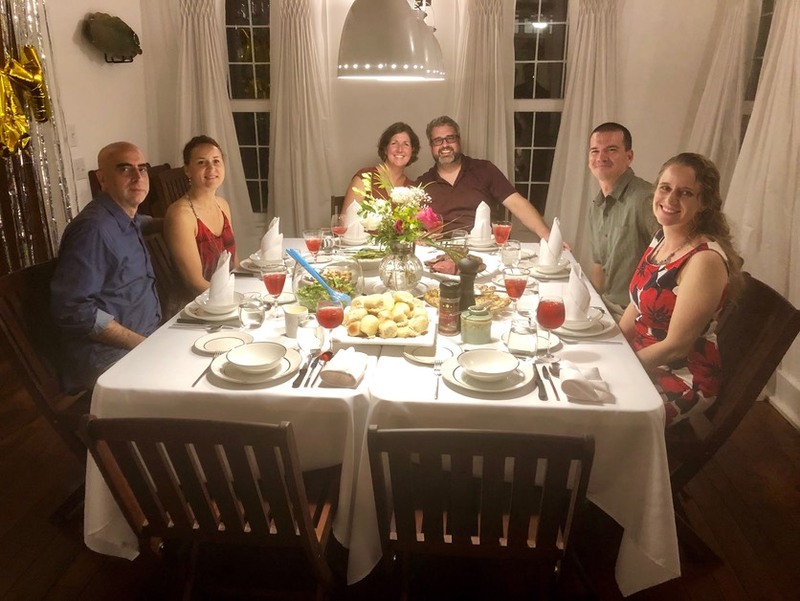 During those few, very cold days in Lima, we all passed the flu around, (so much fun while shopping) but Vann took it up a notch. He developed pneumonia. By the time we got to the northern coast for some time of rest, he was extraordinarily sick. He was coughing up blood, and trembling with fevers. 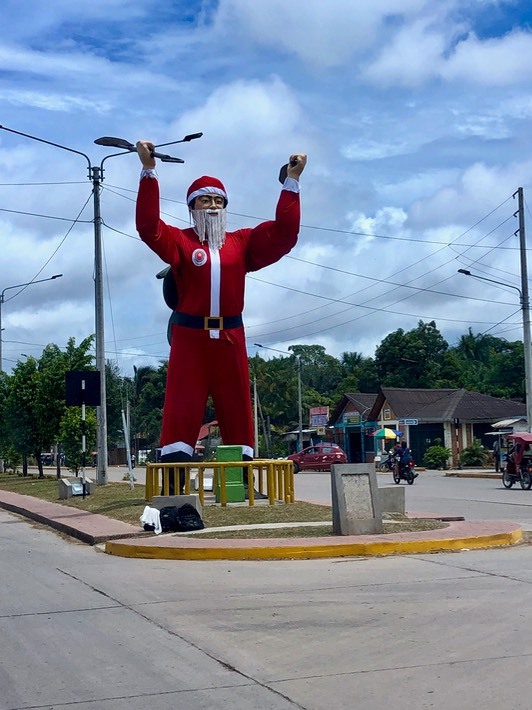 This particular town doesn’t have a hospital, or clinic, or anywhere to go for help within a hundred miles, but they do have a pharmacy which had all of the medication he needed. By God’s grace, that helped him turn the corner. Pneumonia is no joke. 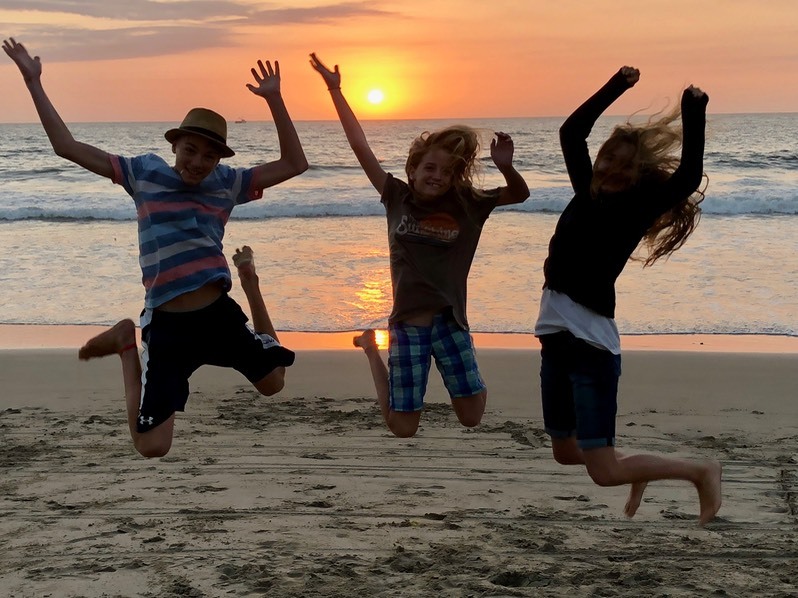 What a delightful place to rest and recover with the salty air and the sound of the surf, even though we would have preferred to have our Vann healthy to enjoy our time away, we are grateful. This sickness has knocked him for a loop. We’ve been home for a week and a half, and he is almost as sick as when we got home. The massive cough and the extreme fatigue have clung to him, and from what I’ve learned, that may last for quite some time. After a couple of hours of work in the mornings, it takes little encouragement to get him to lie down. I have never seen him like this. Please pray for a quick and complete recovery! 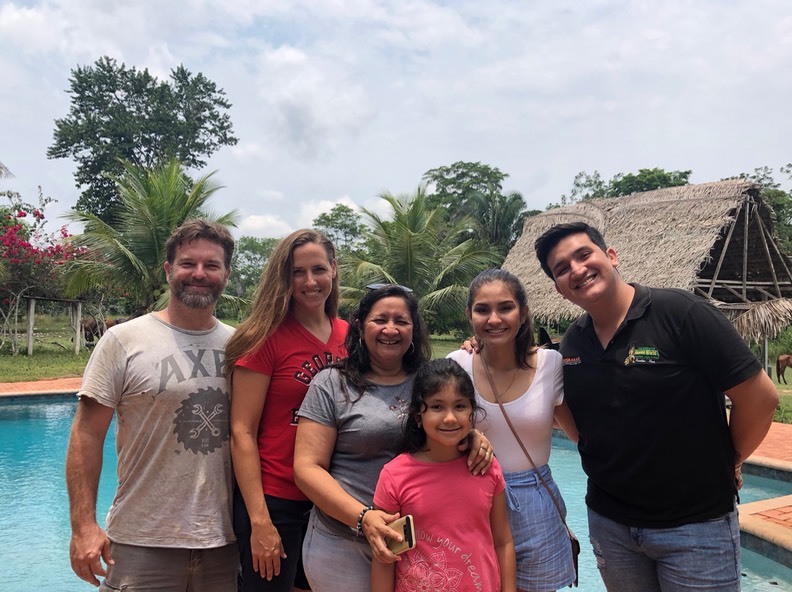 Even with all of the sickness during our travels, we had several opportunities to share the good news of Jesus with several people along the way. The sweetness of His love touched the lives of friends and strangers alike. We are so very grateful that He uses us in His kingdom work. One of the more difficult realities of our lives as long-term missionaries is having to say goodbye to so many of our fellow missionaries. Our dear friends and neighbors of fourteen years moved away recently. Their girls were ours to keep for the last couple of months, and were some of the closest friends our girls had here on our dirt road so far removed from the city. To say that they are dear friends is truly an understatement – they are family. This is the kind of suffering that is easy to be grateful for because it is an indication of much love given and received. On a happier note, Vann’s mom is here! She is always such a joy and an encouragement for us to have here, and we are so very thankful for the time that we get to spend together. She has gifted us not only with her presence, but also with beautiful, skillfully crafted quilts that she made for each of us! 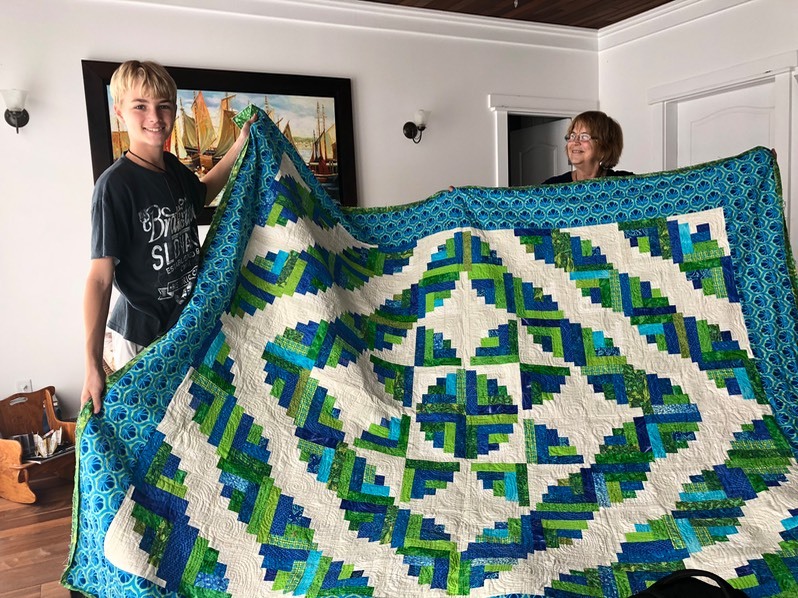 There is one for each child, (matching their rooms of course) and the most beautiful quilt I’ve ever seen for our master bedroom. 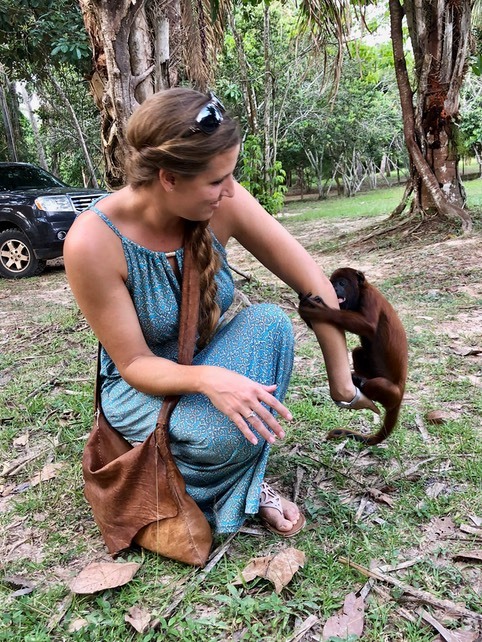 It is difficult to describe the joy that we feel to be able to have heirloom gifts here in the jungle, where most things like that are part of the sacrifice of leaving our birth country. God cares so much about every detail of our lives. 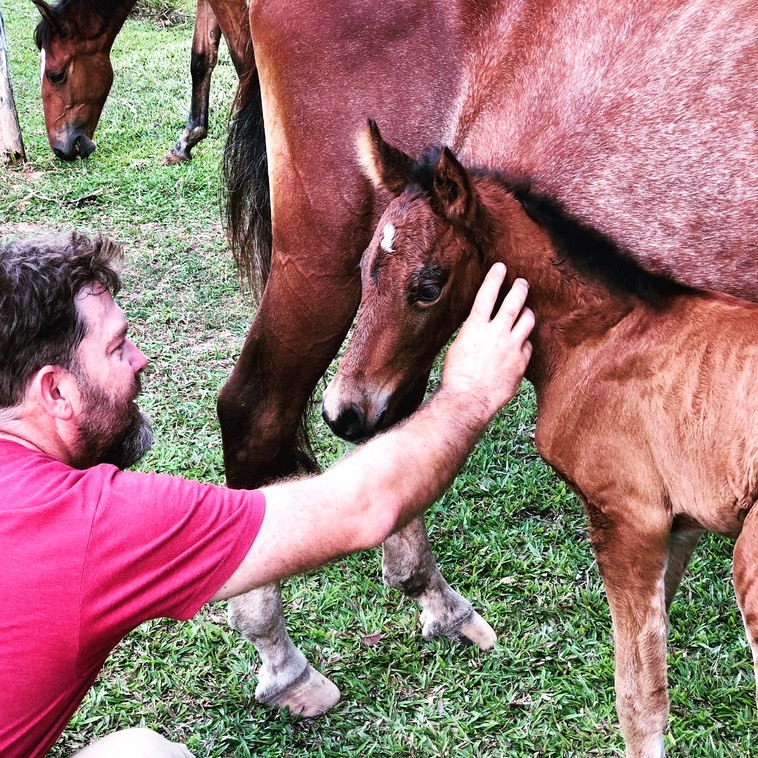 A brand new filly was born to the farm yesterday! She is so lovely, and we can’t wait to see what her personality is like! They are each so unique. 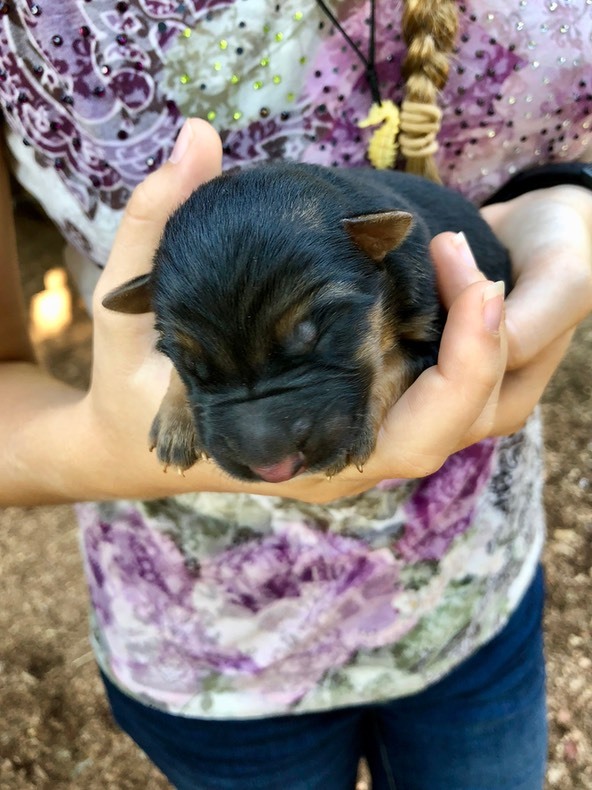 We also had a small litter of three puppies born to our German shepherd this week. Needless to say, we are loving all of the babies! This summer we are taking the time in the evenings to listen to the audio version of Frank Peretti’s “This Present Darkness” as a family. We listen while we each have a craft or something busy to do with our hands. This is not only a teaching opportunity for our children to learn the importance of prayer in our spiritual battles, but also a good reminder for ourselves. We’ve noticed a growing trend in our culture of trivializing the spiritual realm, and forgetting to be cautious of things that may be a threat to our families. As the saying goes, "The finest trick of the devil is to convince you that he does not exist”. We want to train our children to be sensitive and aware that our fight is not with the people around us, but with the powers and principalities of the enemy. Sure, it's a little more blatant here with witches and shamans in every village, but it exists everywhere. We must remain vigilant. Thank you all for your prayers for us. Please keep lifting us up to the throne of Grace. · Please pray for Vann’s health, for healing and strength so that he can get back to all of the base projects and work that is weighing so heavily on him. 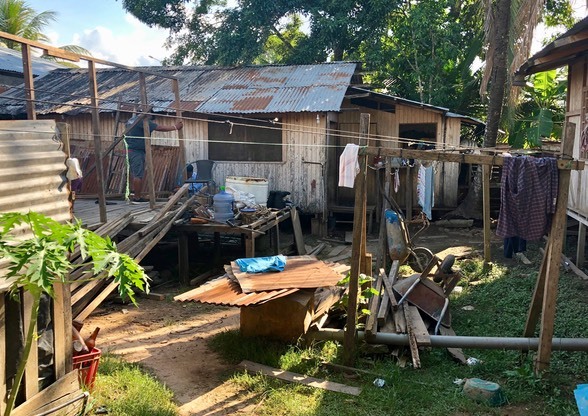 · Please pray for our house helper Milka’s health, and for her husband’s salvation. · Pray with us for the salvation of some of our dearest friends and some newer ones. 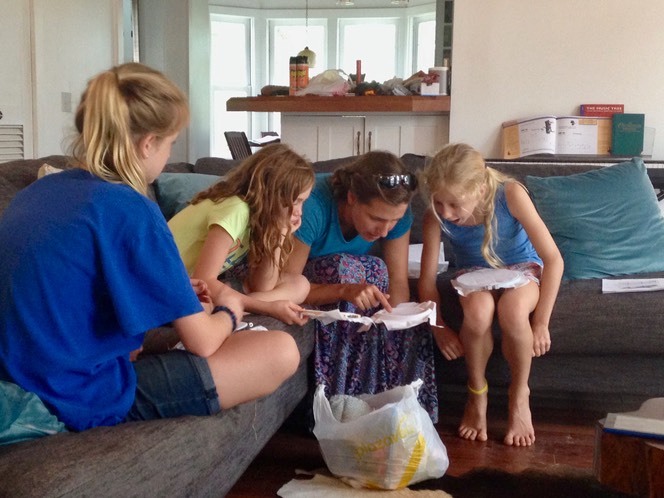 · Please pray for Aurora’s family – their motorcar was stolen this week. 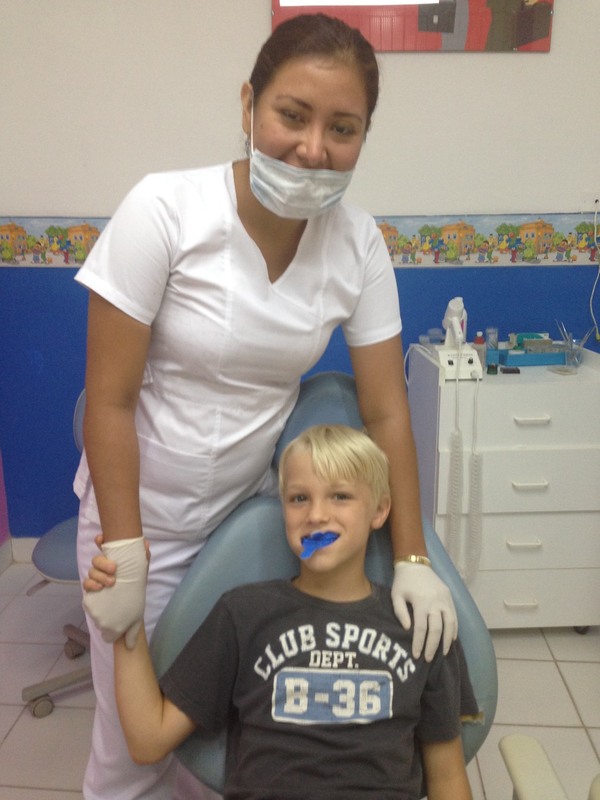 · Please continue to pray for Felipe’s hand – of which he still has very limited use. · Praise God for healing and strengthening me more and more! 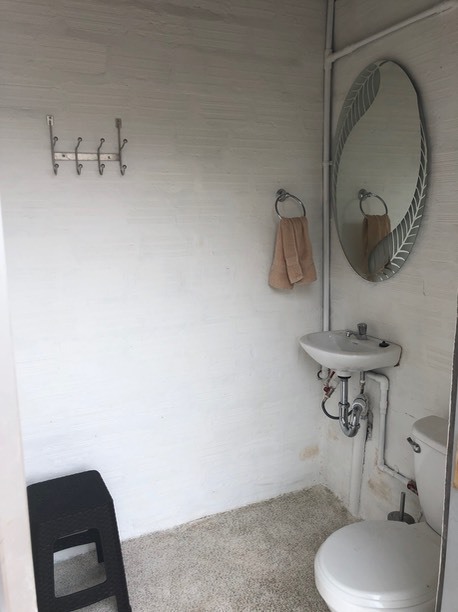 · Praise God for His provision in furnishing this mission house! This month seems like it’s been full of contrasts. Sickness and health, loss and new life, rest and battles, jungle and desert, family and strangers that feel like family. There is so much beauty and depth in contrasts, and our great God is in control of it all! All for the glory of His great name!